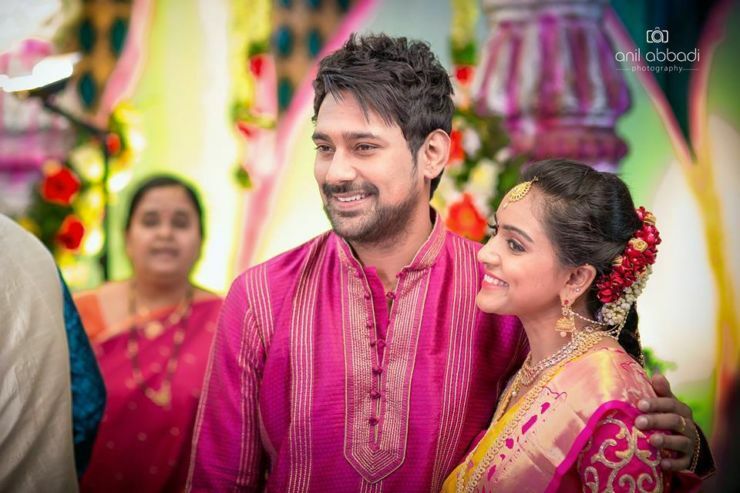 This is a fairytale lovestory of two tollywood stars Varun Sandesh and Vithika Sheru which ended happily. 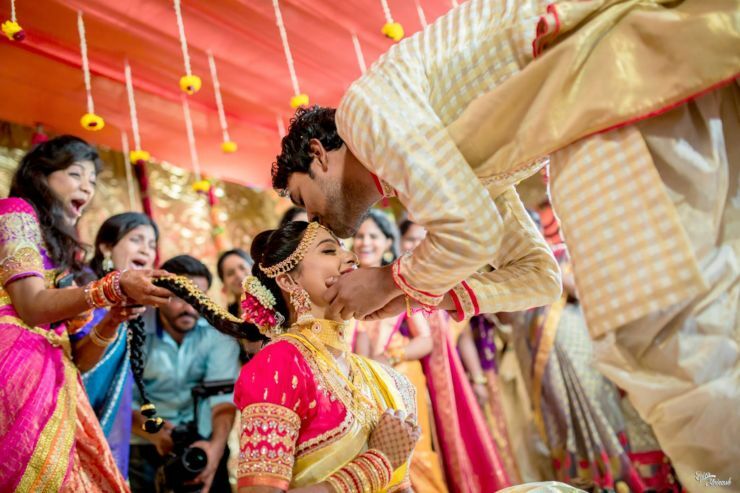 Varun Sandesh started his career in 2007 as an actor with superhit film HappyDays, directed by Sekhar Kammula. 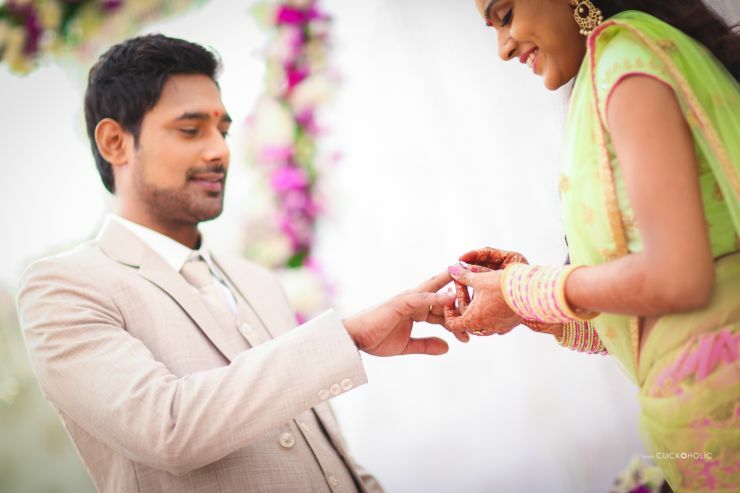 Varun Sandesh is the grandson of noted Telugu writer Jeedigunta Ramachandra Murthy, who worked for All India Radio for 28 years in Hyderabad. 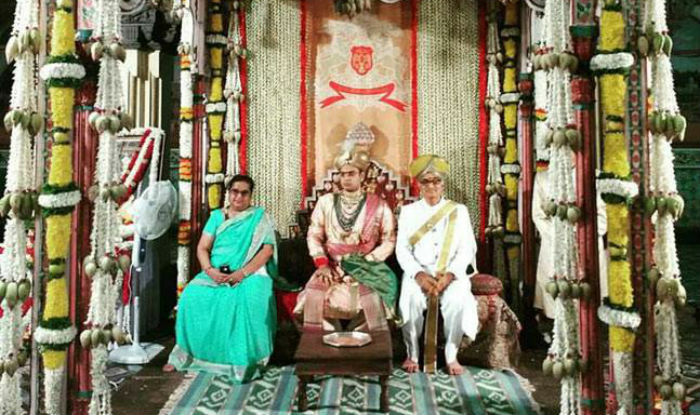 His uncle Jeedigunta Sridhar is a popular Telugu television personality in Hyderabad, India. 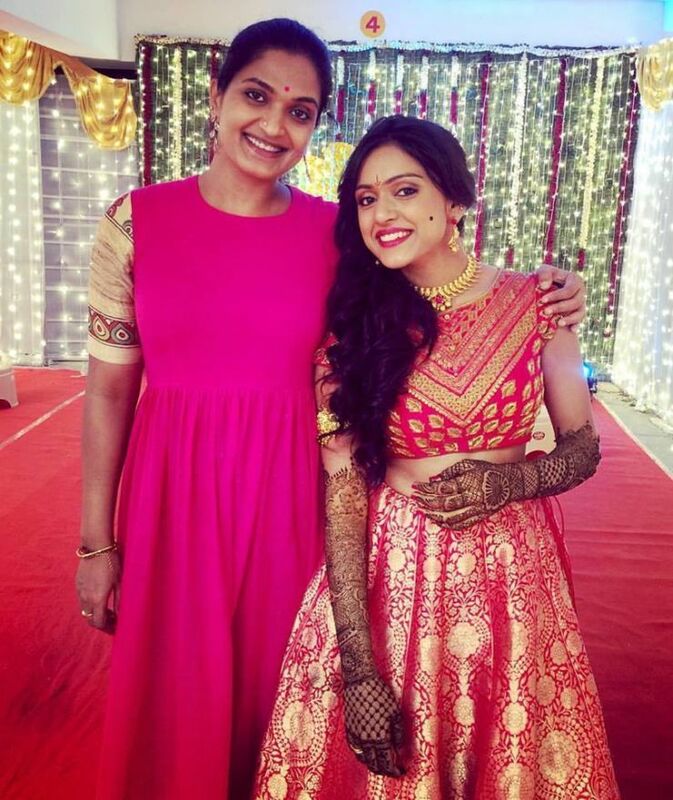 Vithika Sheru started her career at very young age in kannada industry. 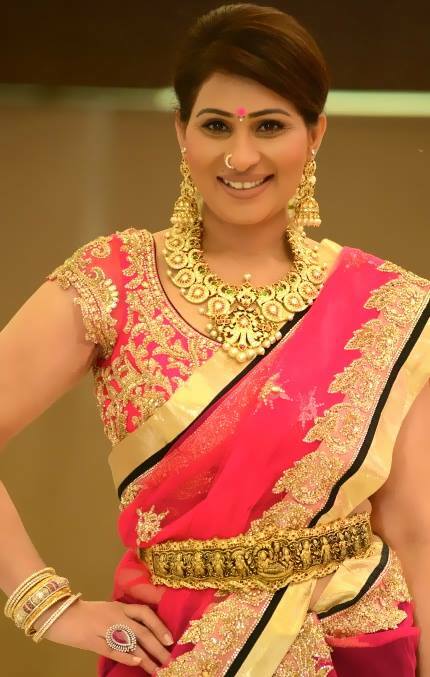 She played lead role in Prema Ishq Kadhal movie. 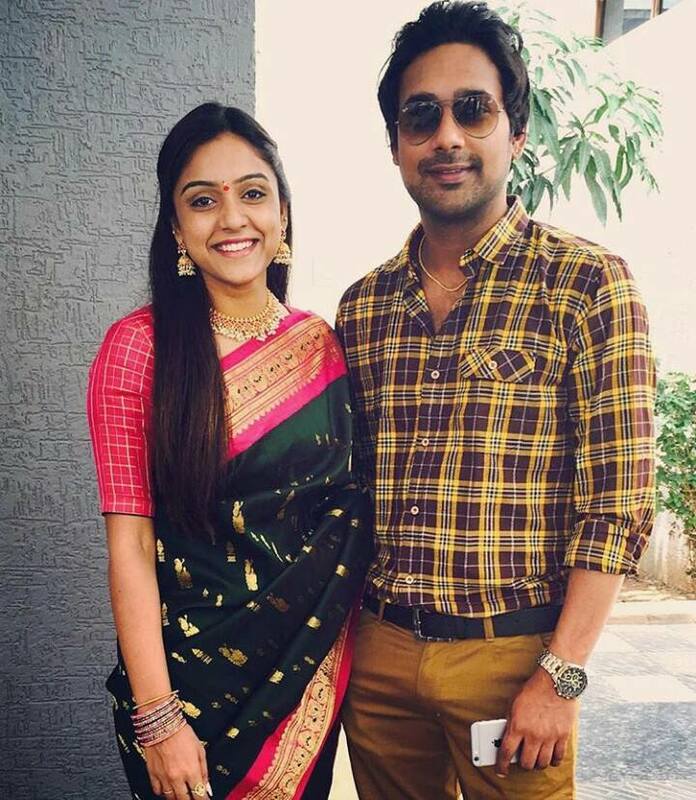 The gorgeous couple acted together in a film “Paddanandi Premalo Mari” directed by debutant Mahesh Upputuri. Their journey started with that movie. 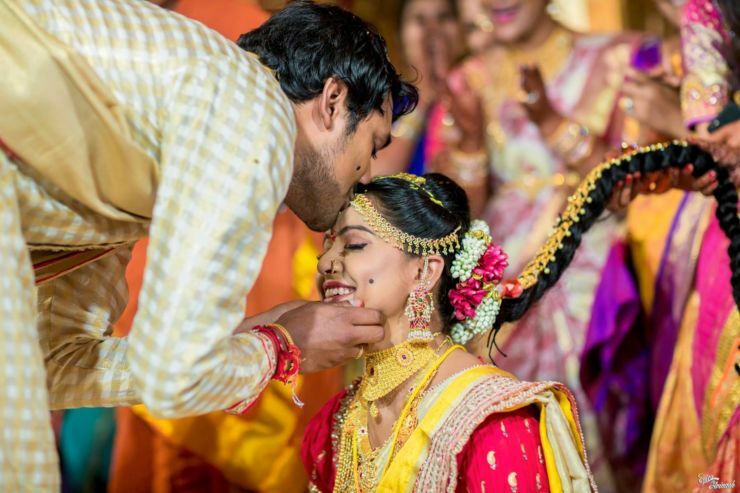 They fell in love, got approval from both families. 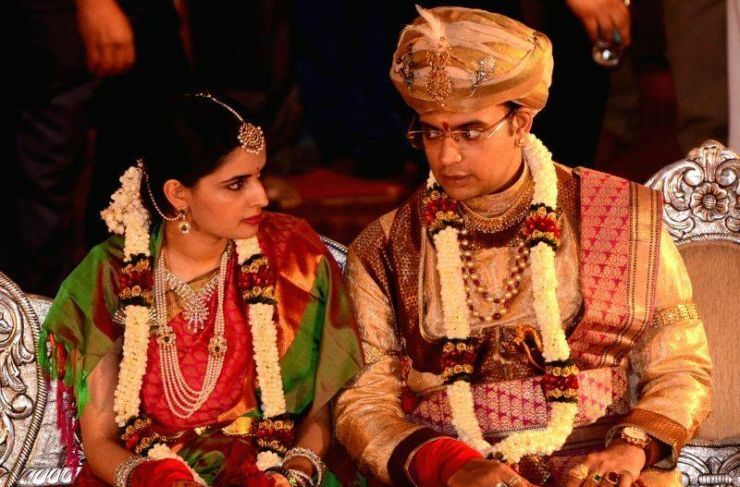 The duo got engaged in 2015. 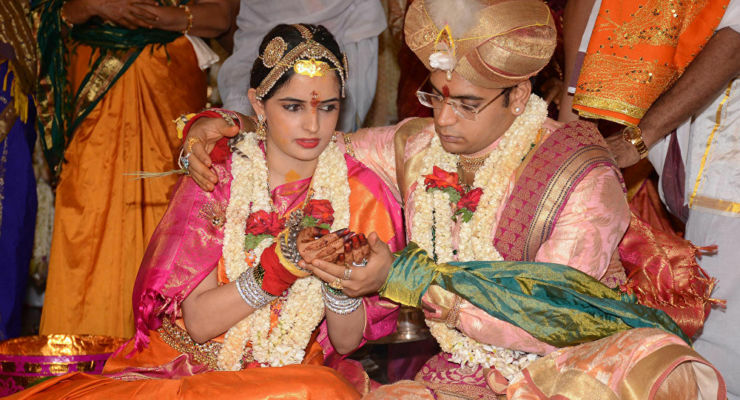 Now after a long gap of engagement function both got married this month. 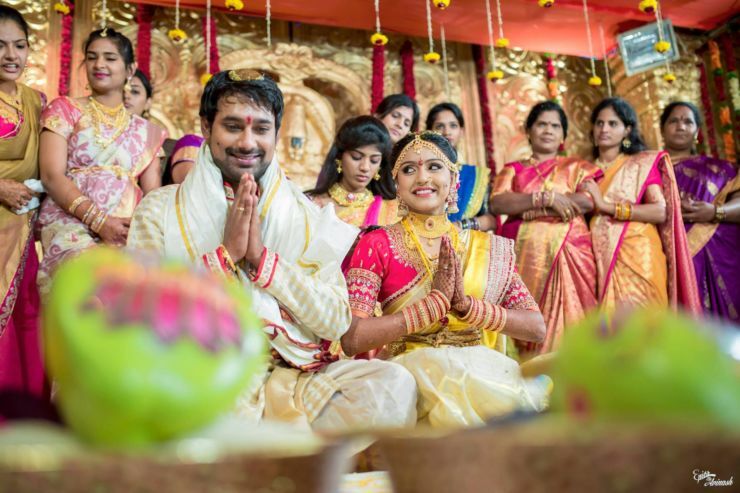 Varun Sandesh and Vithika Sheru got married on the early hours of Friday i.e 18th of August. 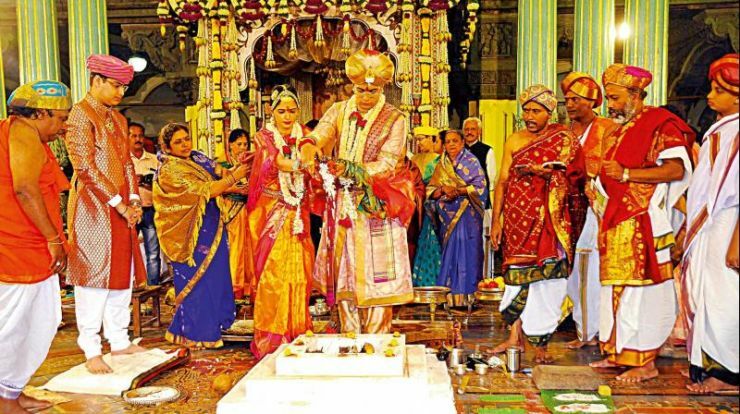 The marriage occured in the Alankrita Resorts in Hyderabad. 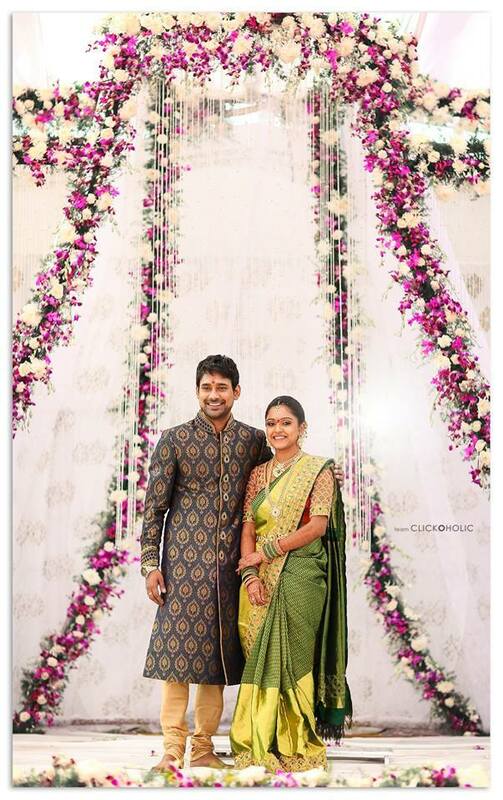 Showcasing few lovely pics of the couple’s engagement, pellikuthuru and marriage functions. 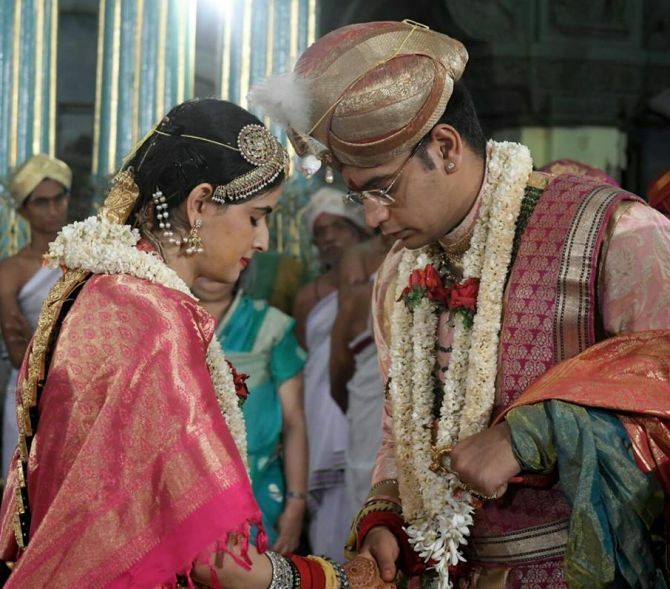 Wish them all the happiness in their married life. 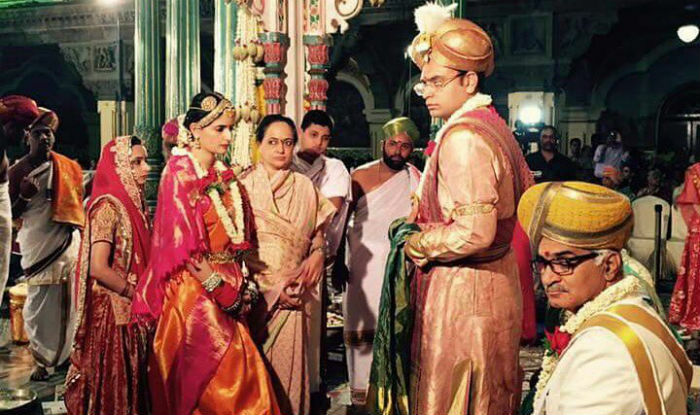 And the new phase of the love story begins for the lovely couple…hope they will happily live ever after…. 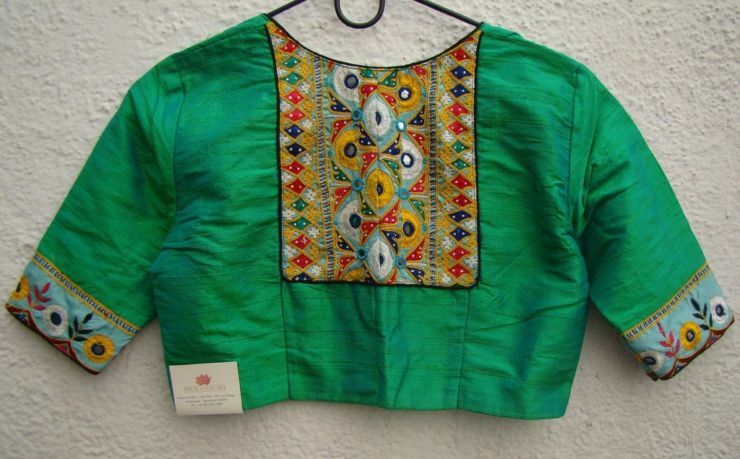 House of Taamara is exquisite place for handlooms, silks and indian cottons from various states. 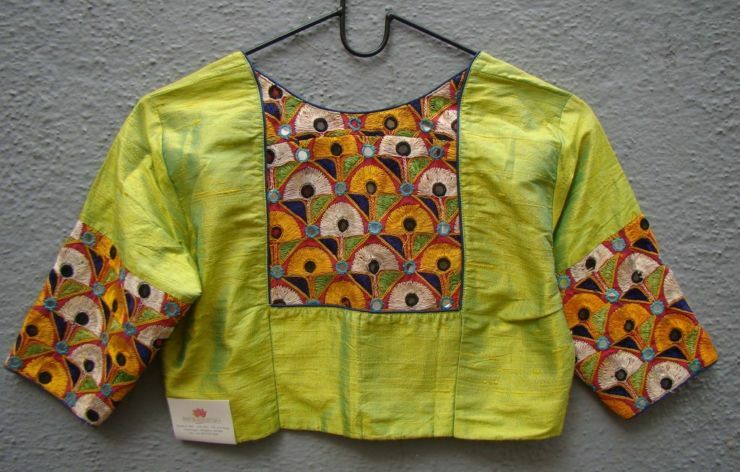 It is a family-run retail business that showcases India’s finest handloom traditions. 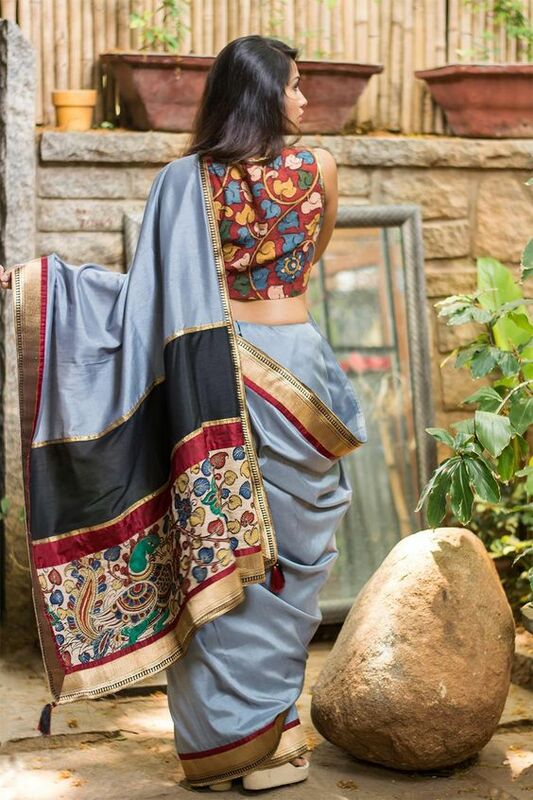 Each saree is chosen individually for the finesse of the weave, and the harmony of colour and design. 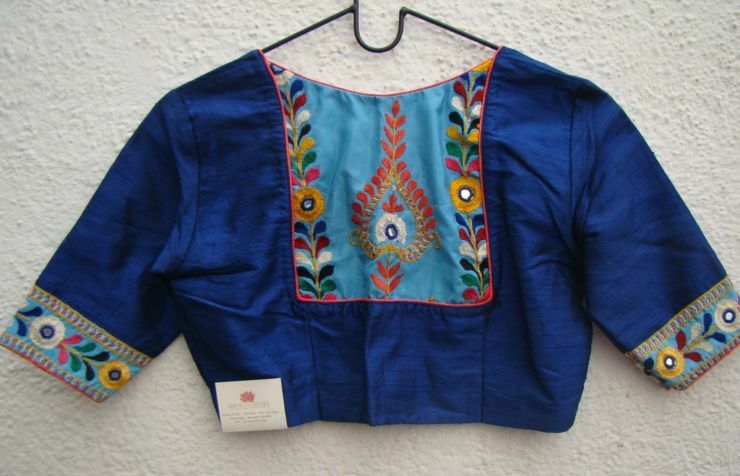 House of Tamara works with weavers and craftsmen directly and try to make an impact on sustainability and fair trade. 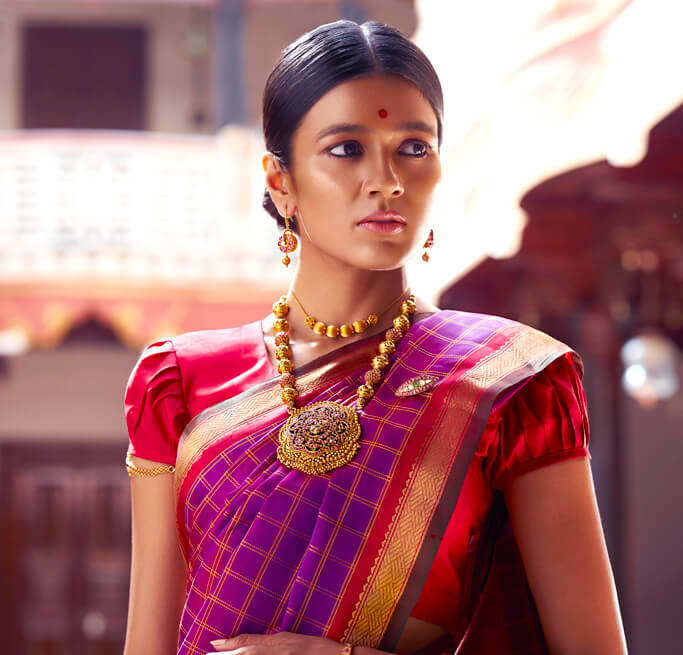 The collection reflects a diverse textile heritage like cottons and silks from the Telangana and Andhra regions. 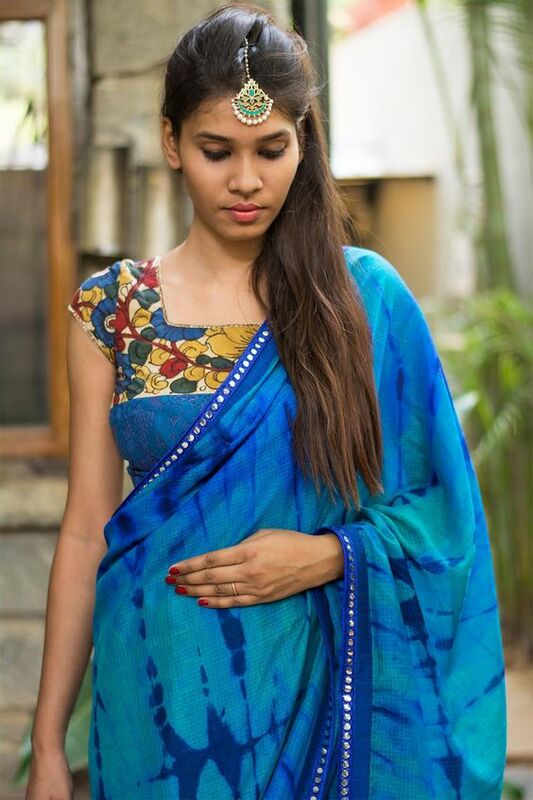 They sell ikat Cottons and Silks, Tussars, Kalamkaris, Mangalagiris, Gadwals, Benarasi, Muslins, Kanjeevaram Cottons, Kanjeevaram Pure Zari Pattu Sarees, Bengal Cottons, Khadi Sarees, and Kasavu Cottons, readymade kutch work blouses to name a few. 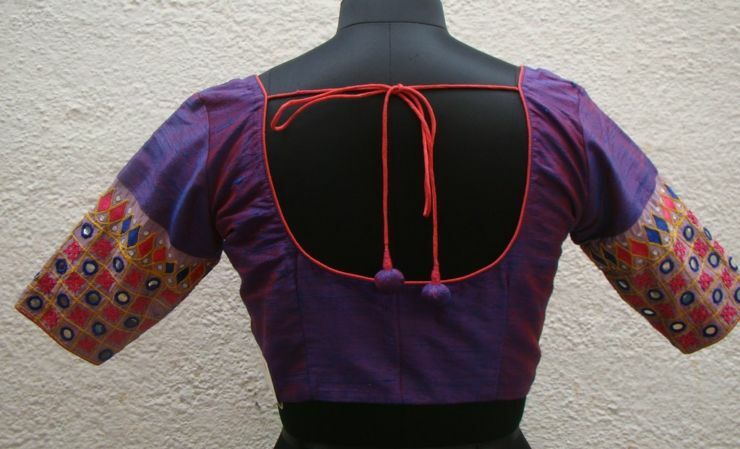 Please note that all the blouses are of bust size 36 and can be altered to size 40. 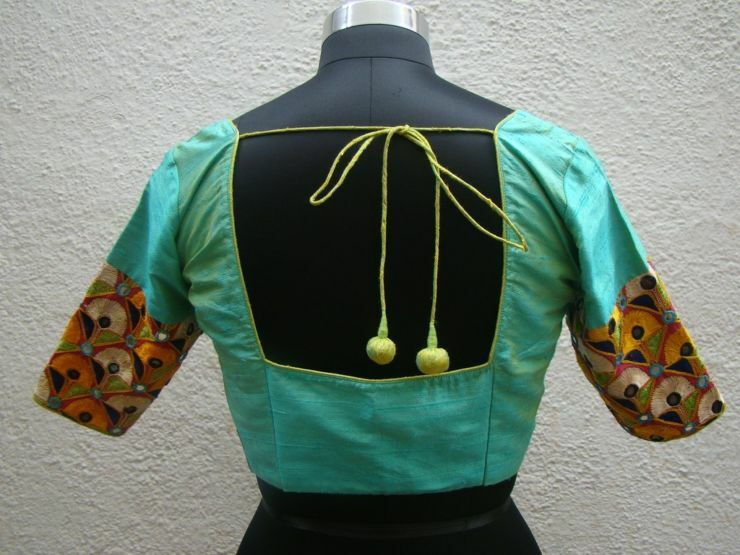 Can also altered to small size as well. 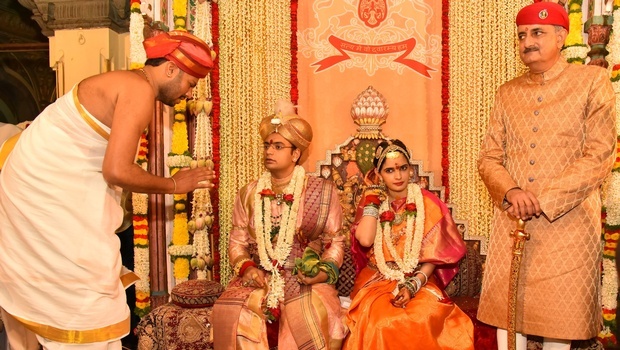 The 27th scion of Mysore Wadiya Dynasty, Maharaja Yaduveer Krishnadatta Chamaraja Wadiyar married Trishika Kumari Singh, from Dungarpur Royal family, Rajasthan. 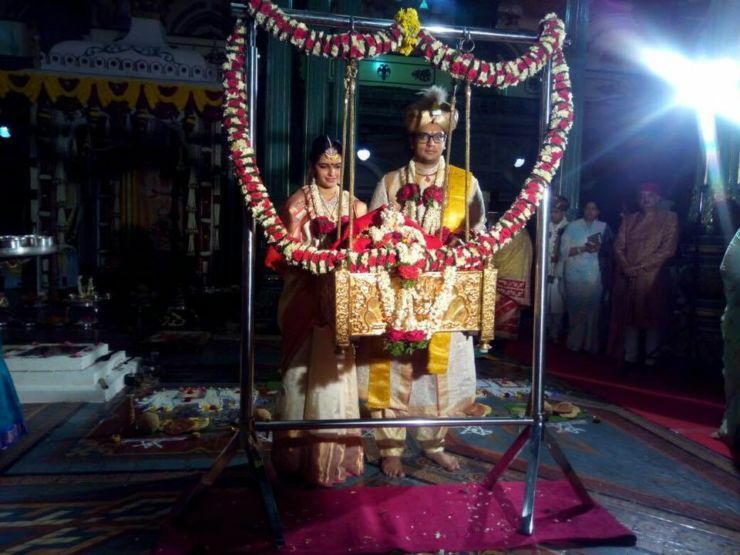 Maharaja Yaduveer tied the knot on 27th June at 10.24 am in Mysore Palace. 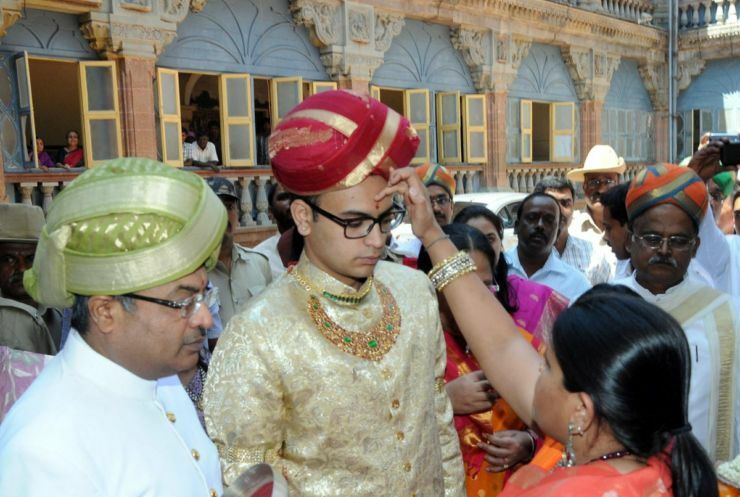 The grandeur of the royal wedding came alive at the Amba Vilas Palace. 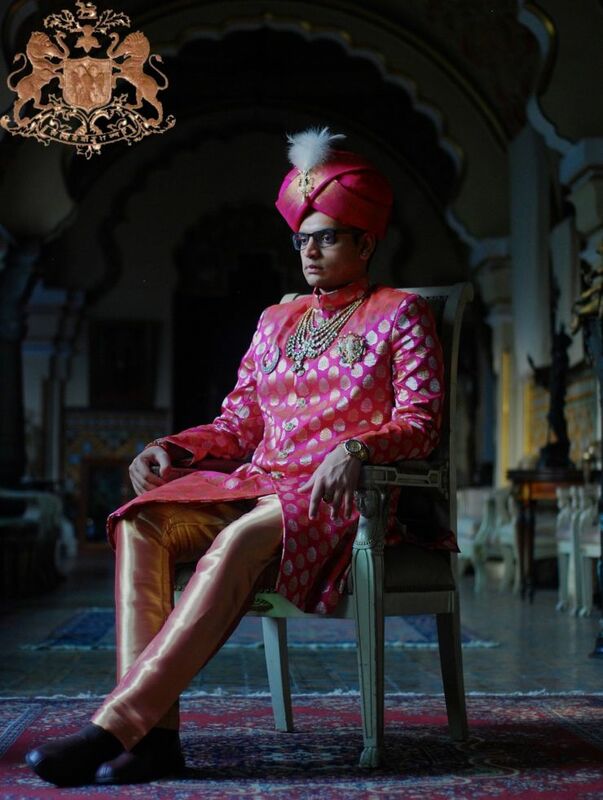 Mahraja Yaduveer was dressed in Magenta Pink Sherwani, an outfit designed by her mother Pramoda Devi Wadiyar. 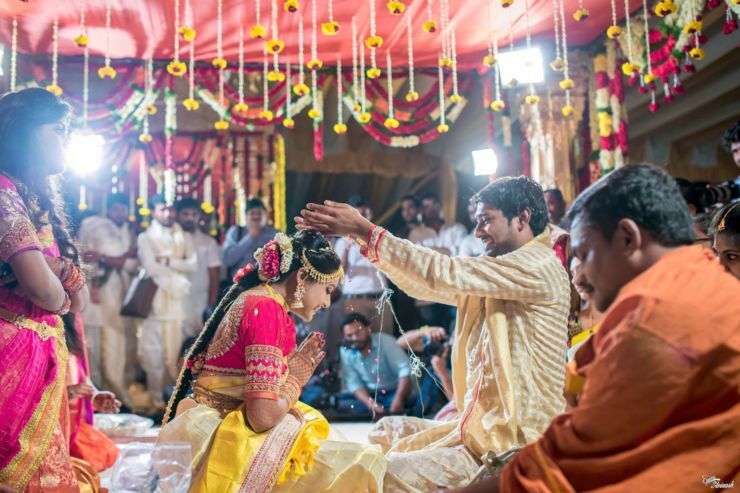 Bride Trishika was dressed in a typical south indian style Yellow and Magenta Pink Kanchipuram Saree with heavy zari border. 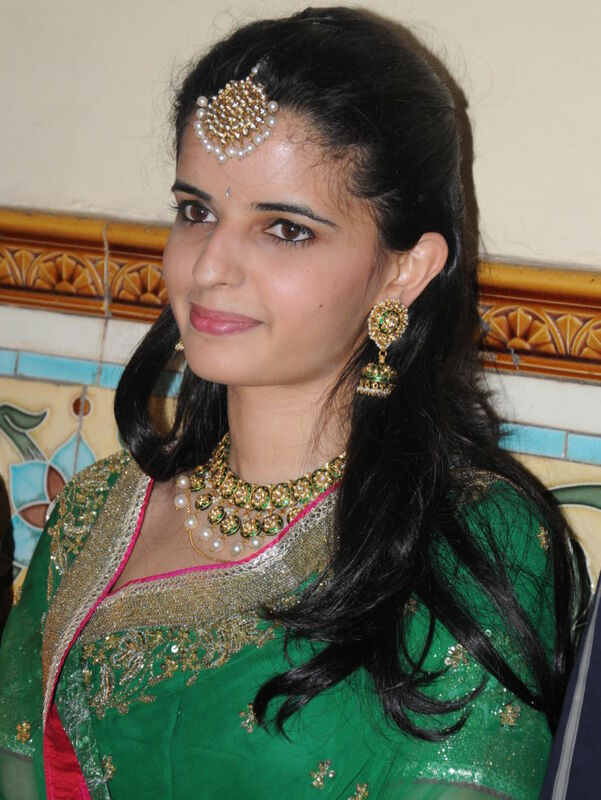 She wore royal jewellery, though simple. 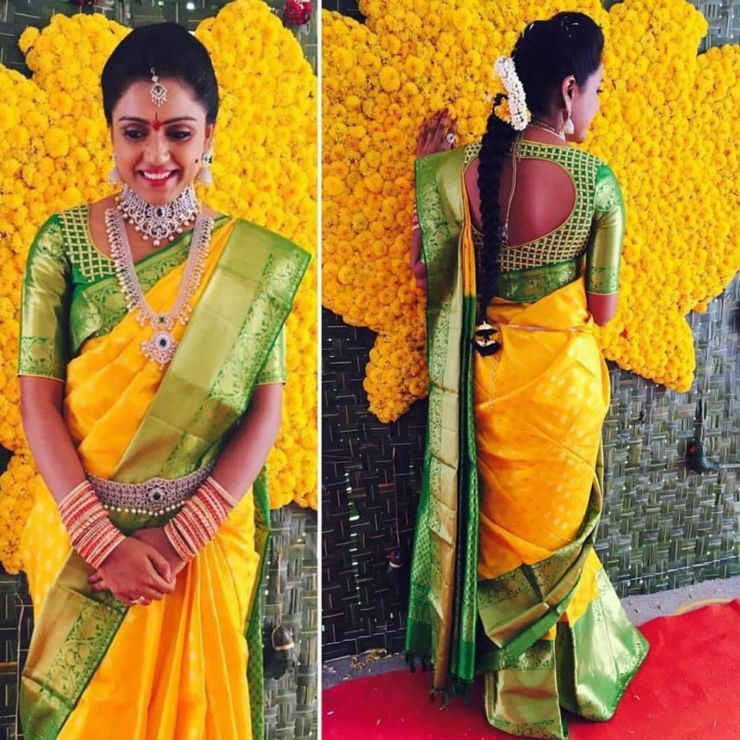 Nethi Chutti was very heavy and added more glory to her attire. 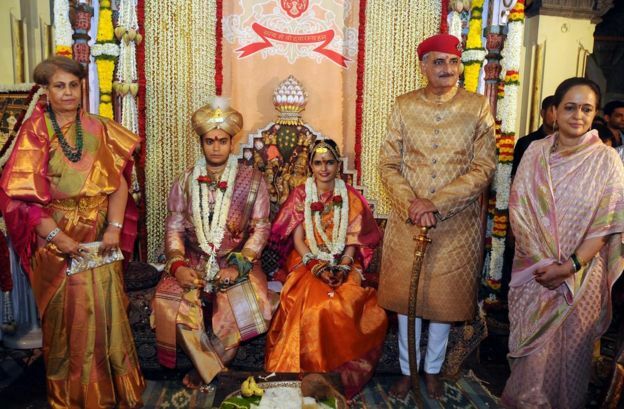 Maharani Pramoda Devi looked after all arragements. 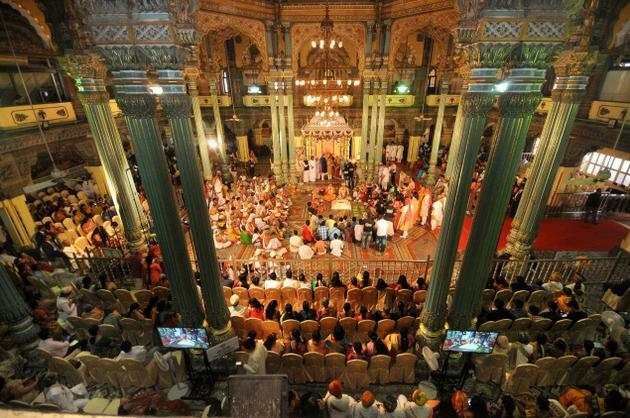 Mysore palace was all decked up with floral arrangement and coming to food, a lot variety of sweets, palyas, rice, curries were served to the guests. Menu had all the Karnataka special dishes. 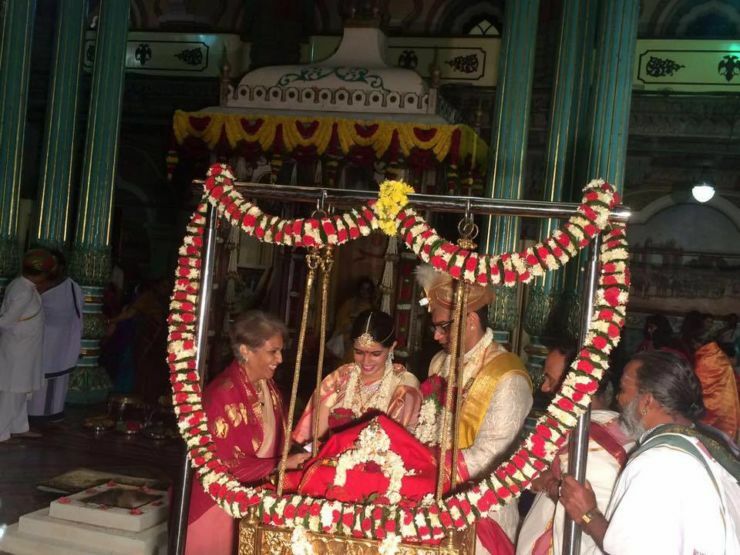 Few Pics of Uyyale Function after Marriage. 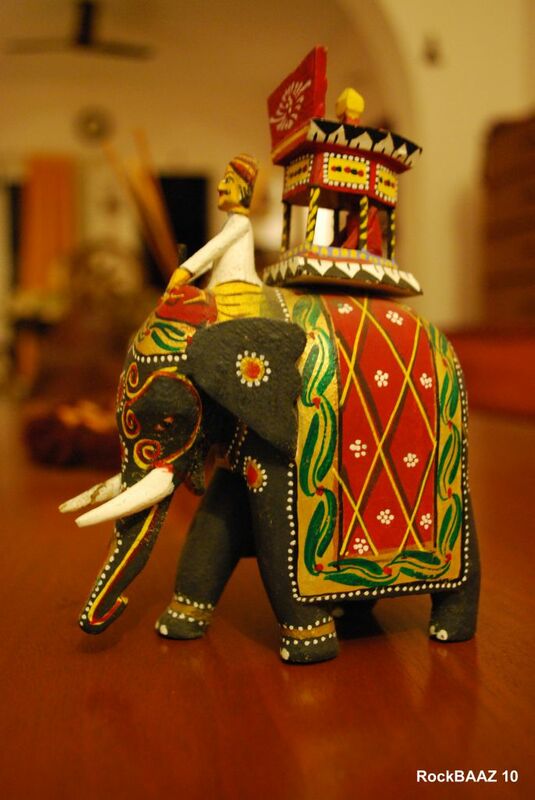 True antique is a rare collectible, a heritage ornament that comes to you with a deep vein of history. 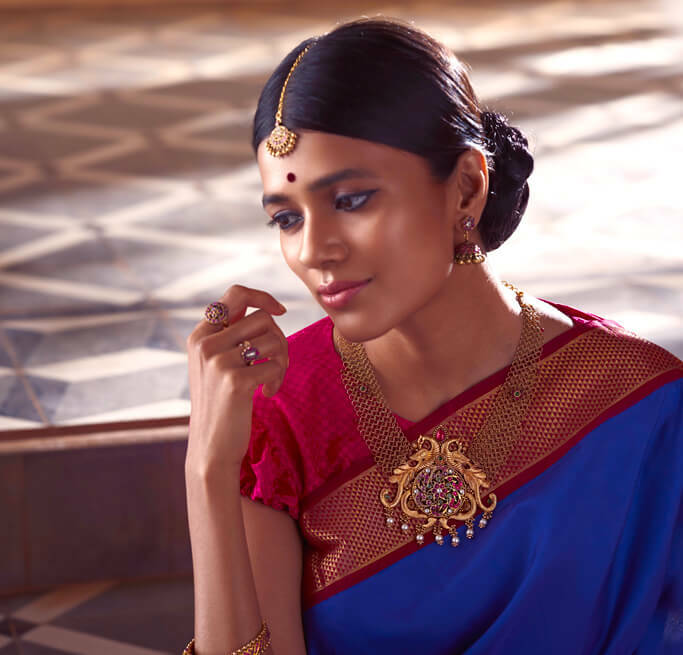 Celebrating a rich craftsmanship that has vanished through the centuries, NAC Jewelers antique collection bear true testimony to the rich cultural history of our region. 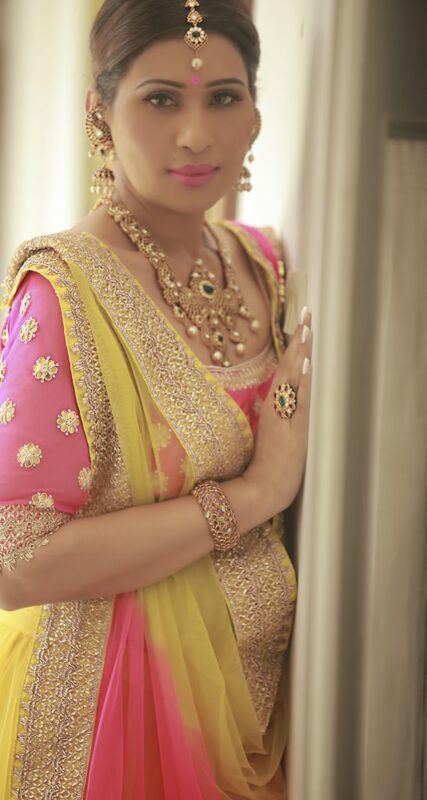 NAC Jewellers collection of antique jewelery is an exquisite range of ornaments that once adorned the women of yore. 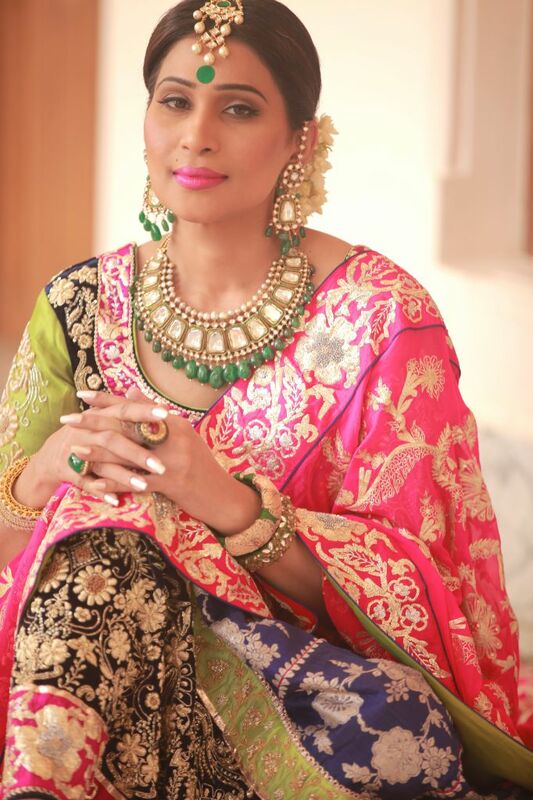 Studded with precious gems sourced from the ancient mines of Burma these jewels are a rare heritage that one would be proud to possess. 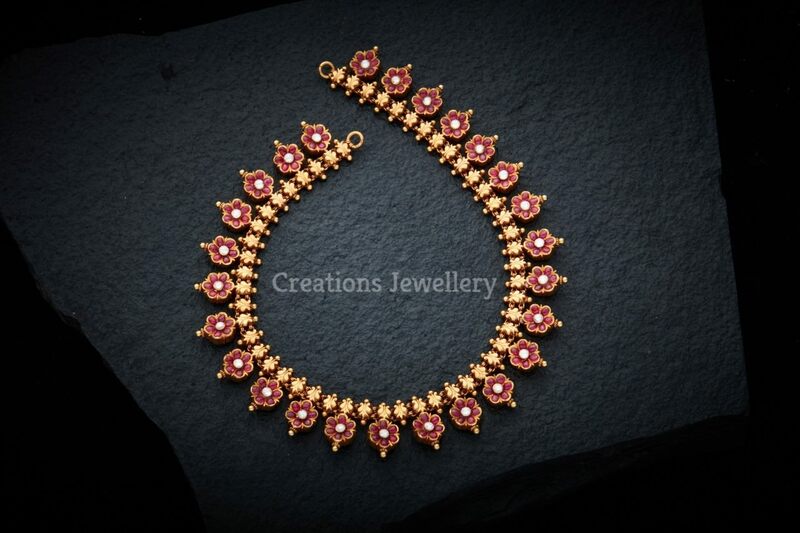 For Price enquiry please contact below address and phone number. 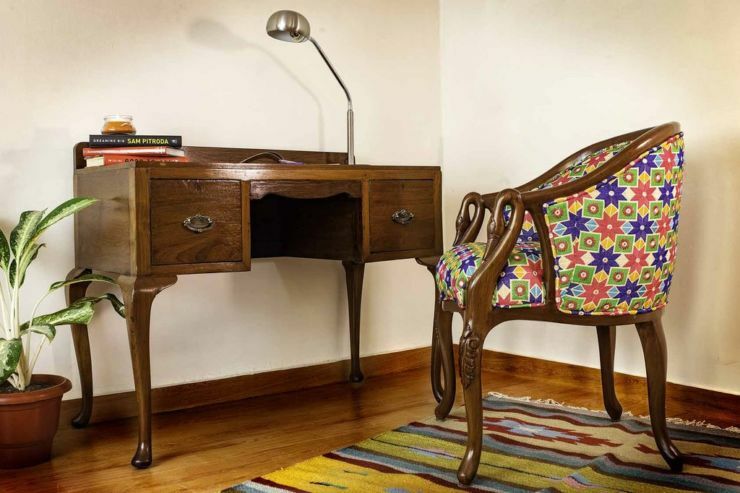 Antique Furniture adds more ethnic look to the modern houses. Now-a-days it is in great demand and highly priced. The earliest furniture was simple and practical, but as furniture became crafted and decorated it became an early status symbol. Wealthy homeowners demanded that their furnishings reflect their status and lifestyles. 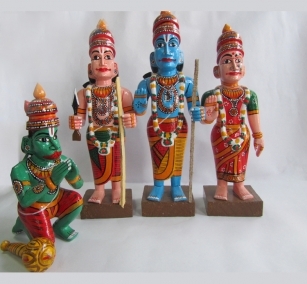 You can shop them in vintage or antique stores, antique fairs or antique shops. Today I would love to showcase the uniquely crafted antique furniture from Auraz Designs. 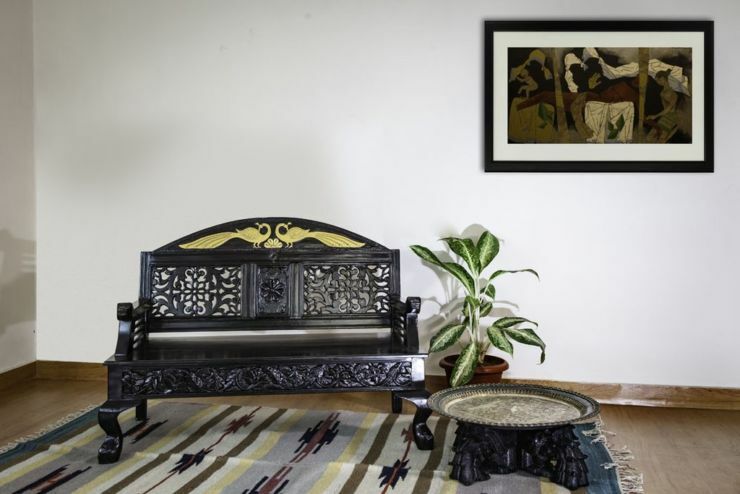 Bangalore based online store Auraz is destination for homeowners and interior professionals to purchase expertly curated looks which blend genuine, hand-picked antiques with modern sensibilities. 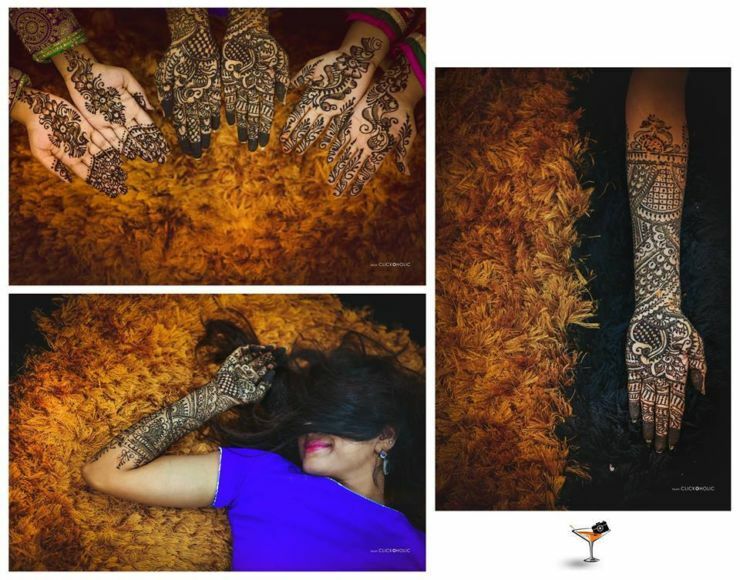 Auraz is more than an e-commerce website. They design cohesive, kitsch and modern looks, with a touch of the past. At Auraz they are reshaping consumer ideas about the design of modern spaces and are passionate about experimental home decor by pairing antiques with modern accessories – helping us blend history and modernity and selling antiques. If you want to purchase them please visit their website for price details. 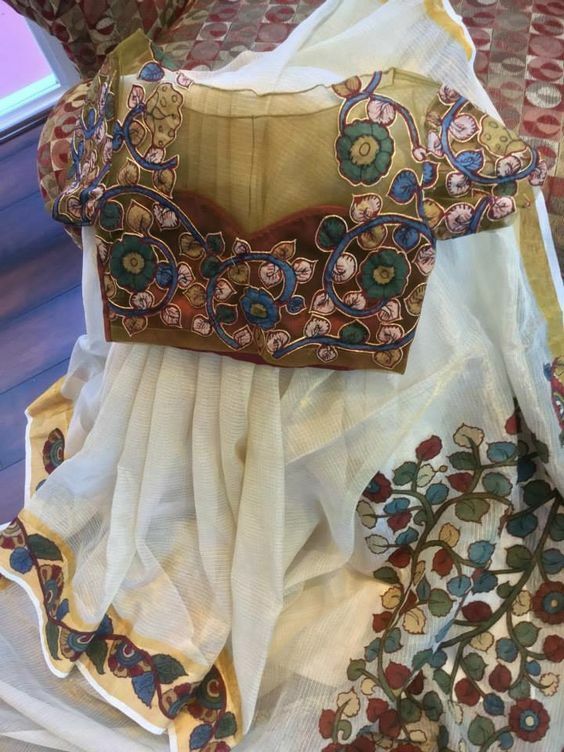 A family heirloom from the 1940’s, this piece has been passed down from aunt to niece. 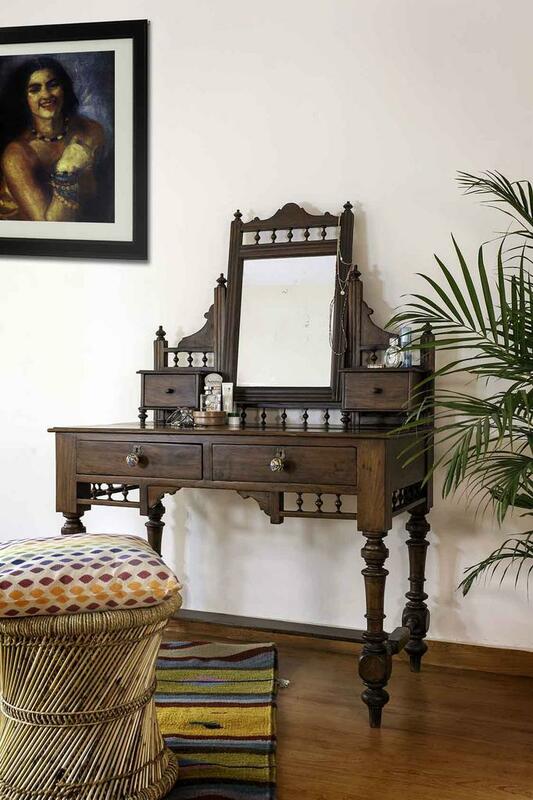 Handcrafted from teak wood, this beautiful piece has turned legs with two drawers in the main unit as well as two smaller drawers on either side of the mirror. 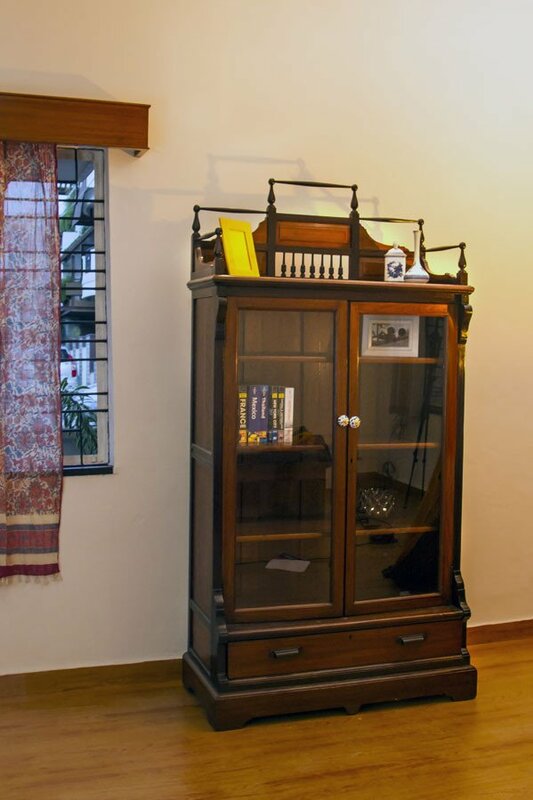 From 1930’s, Polished in two different tones, this versatile bookshelf/cupboard/display unit is made from Rose & Teak wood. In addition to four adjustable shelves, this unit has glass doors with white and blue enamel knobs, as well as a bottom drawer for storage. 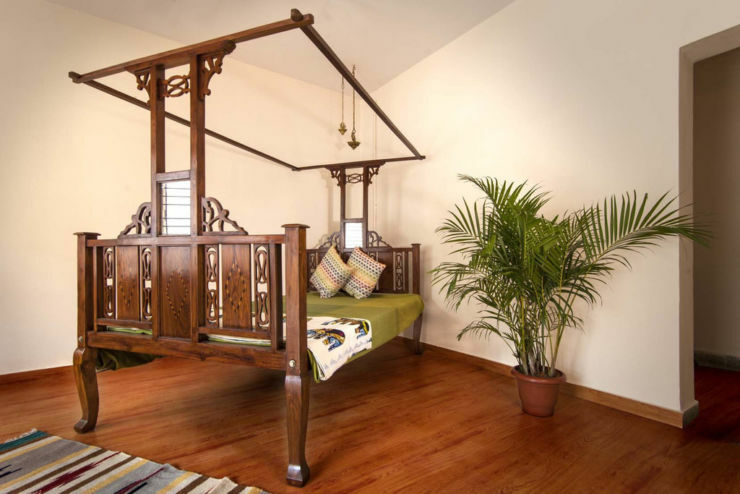 Made from Teak Wood this Parsi bed has unique lattice woodwork panels as well as exquisite wood inlay panels. The bed comprises of a center column, which supports the framework atop used for placing a mesh to keep out pesky mosquitoes in yesteryears. 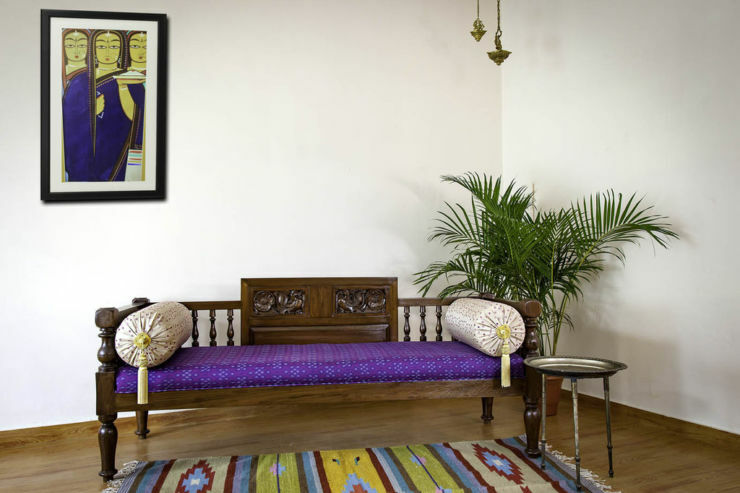 Dark Rosewood chair from the 1940’s with a carved center and an addition of a traditional Phulkari cushion. Accompanied by a hand carved Burmese teak dowry chest from the early 19th century with hidden chambers and a rich history. 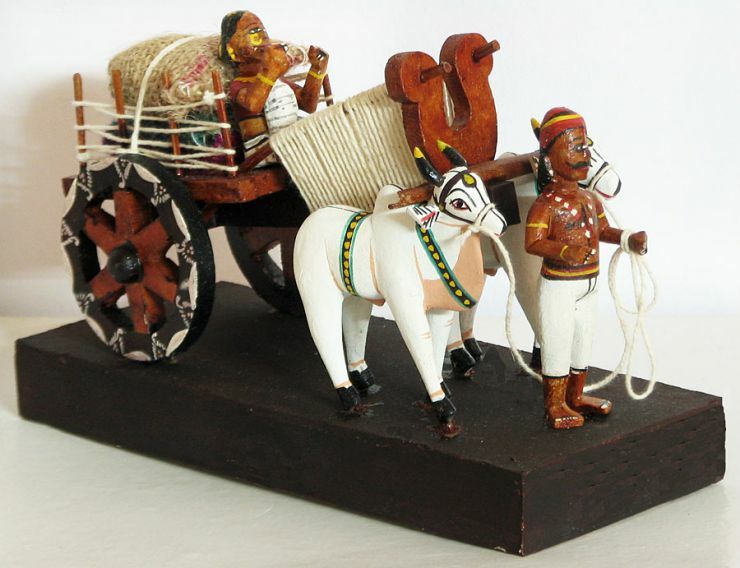 Built out of Rosewood, this Kerala day bed belongs to the mid 19th century. 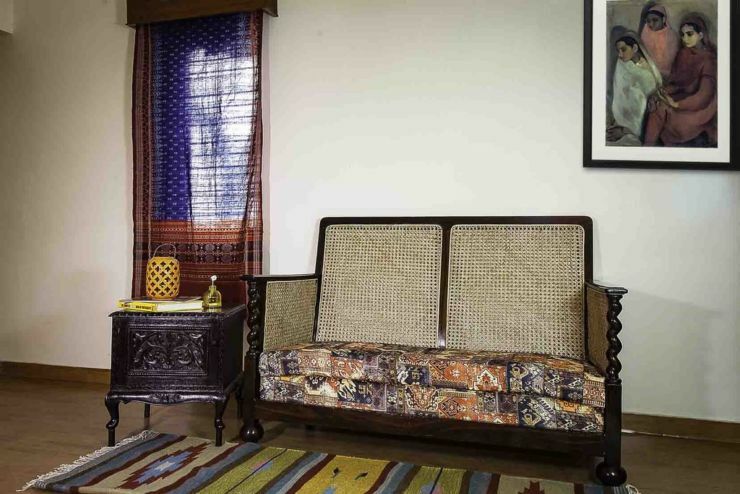 With exquisite hand crafted spindles and relief carved center back panel the diwan had been upholstered in an Ikat fabric tying in the different cultures of India. Paired with a metal table in brass from Egypt, this look is truly international in its composition. This dark Rosewood low double seat is painted a deco black with gold peacocks and a lattice carved back. The seat has a carved panel and straight lined hand rests. Paired with an Egyptian plate with a temple pillar capital from the 1940’s to the 1960’s. Built in the 1970’s during the art deco period, this teak wood study table has clean lines characteristic of the period. 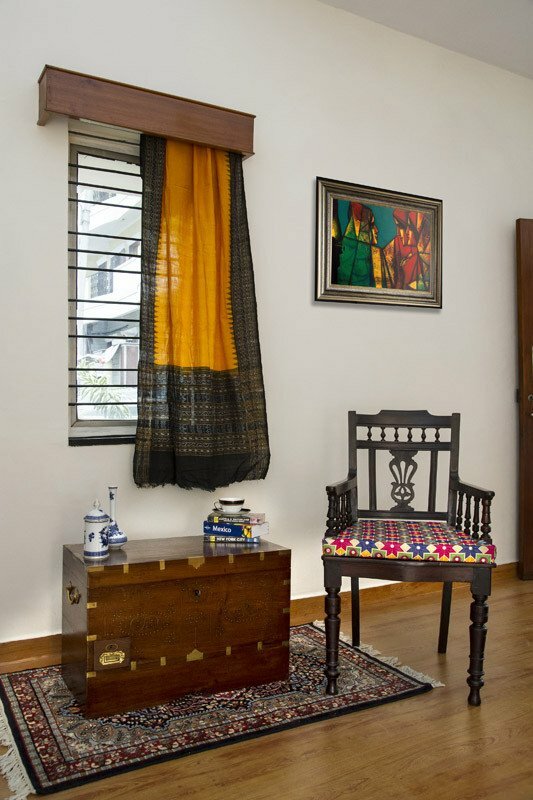 With two built in drawers, this table has been paired with a Burmese teak wood chair with traditional phulkari upholstery to bring out both the carving as well as the colour of the wood itself. 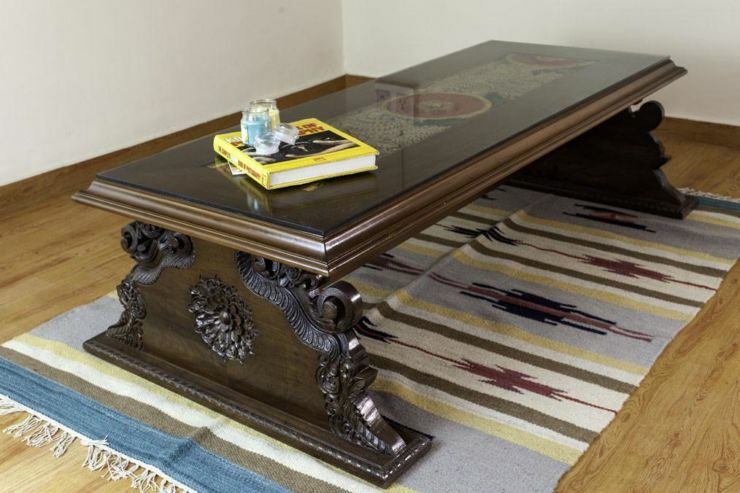 This table is constructed from salvaged panels of a Chettinad temple. 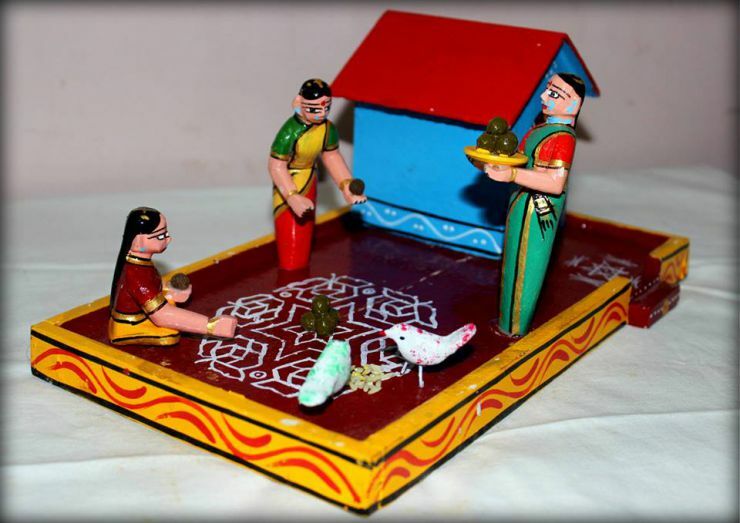 The centre panel of this centre table is preserved as is with the original vegetable dyes in red and green. The legs are made of mahogany carved in relief and polished to bring out the rich wood colour. From the 1940’s this wicker seat is sturdy with clean lines. Paired with a side table made in Mahogany with a rosewood polish from Calcutta provides a mix of influences from both the British and the Portuguese. 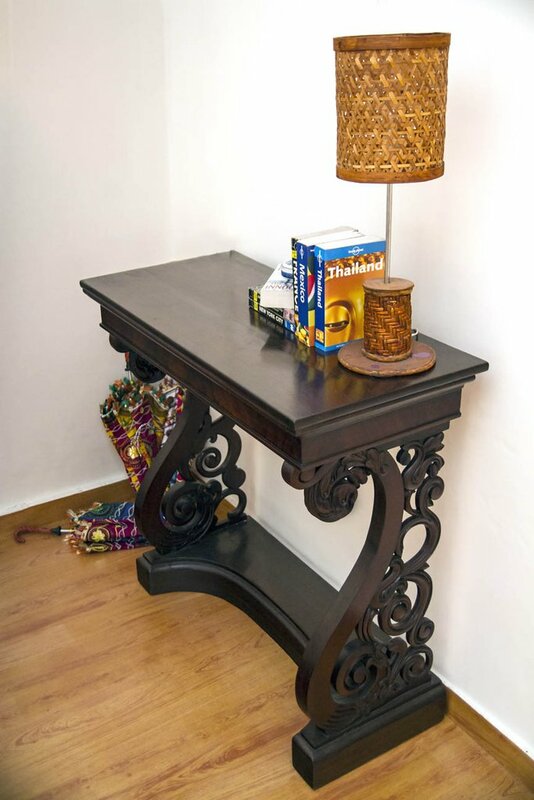 This dark wood, Mahogany console table was built in the 1900’s. Found in Pondicherry this exquisite table with carved sides is a classic reminder of the French Colonial style. 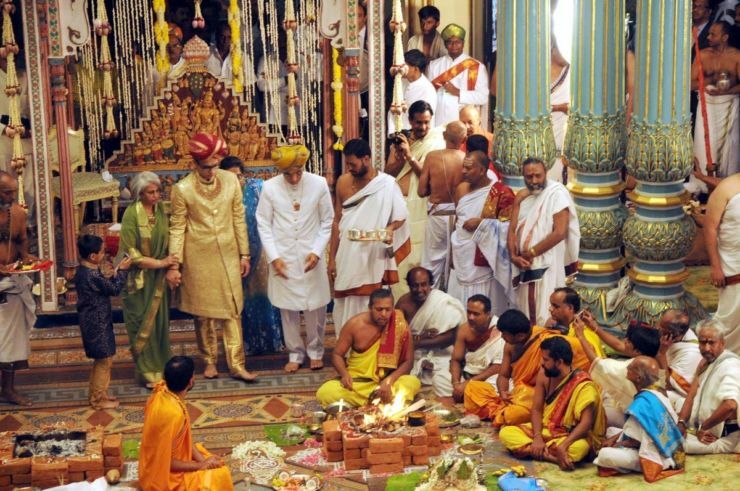 Gudi Sambaralu is an effort to bring awareness and inspire civil societies, to nurture our culture and heritage; and to help understand the divinity of all creation. 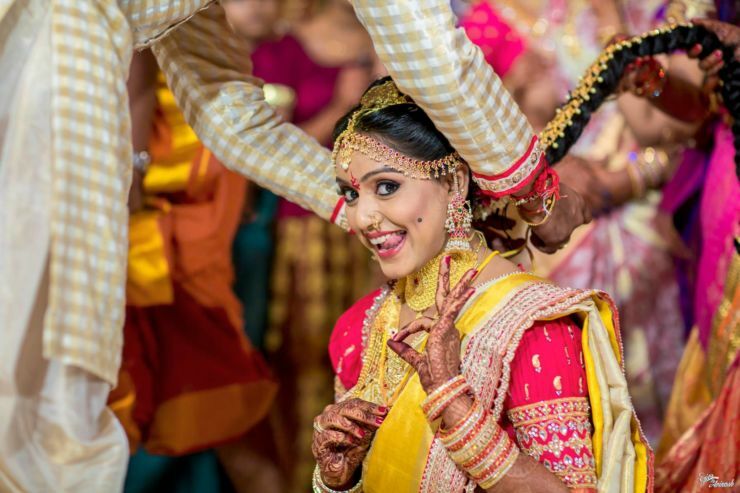 It is an initiative brought by Parampara to spread our rich Indian culture and heritage through performing arts. 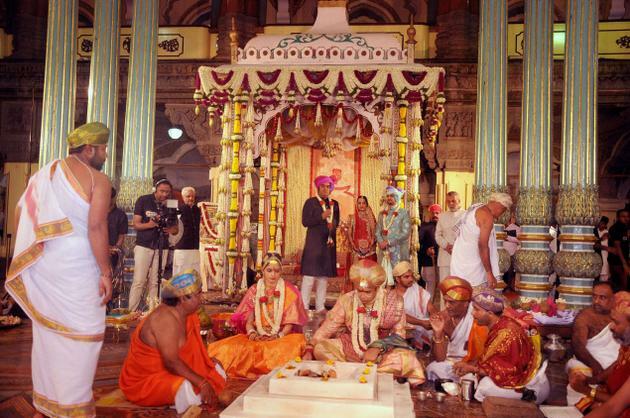 Different cultural activities are held at a selected heritage temple in or around Hyderabad city. 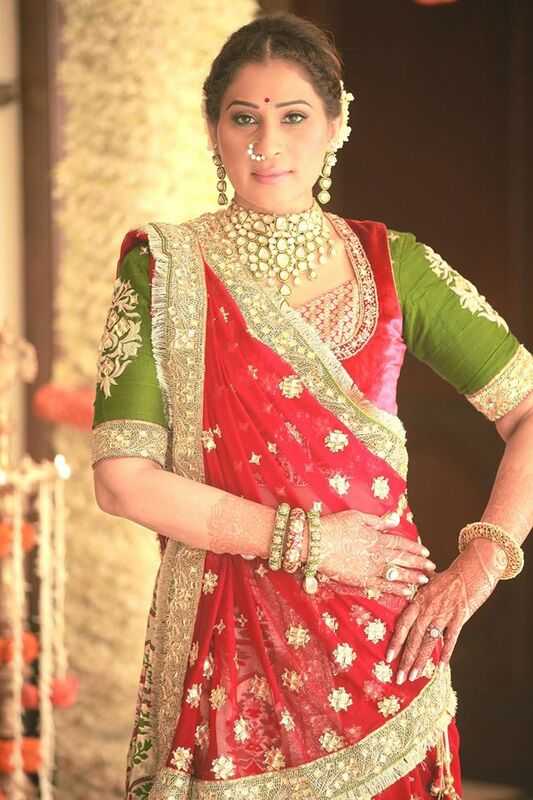 Now, showcasing few stunning pictures of Designer Shilpa Reddy Sarees who was spotted in ethnic wear. 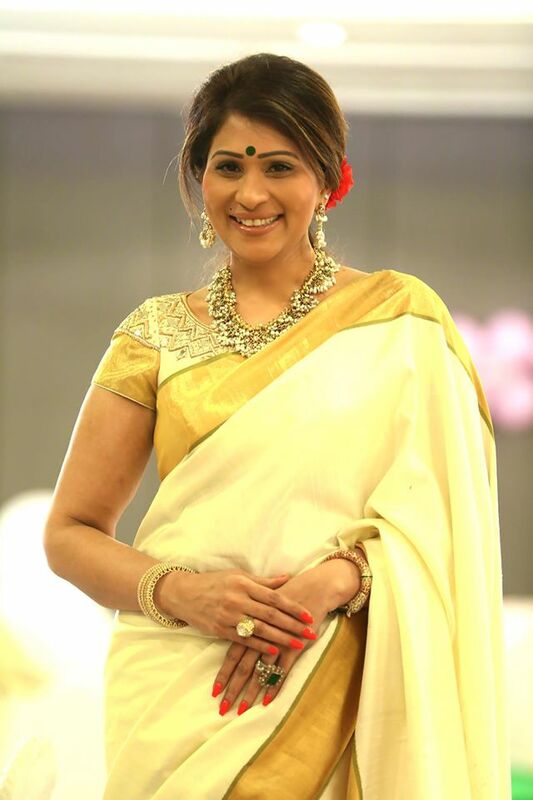 She paired classic benaras and kanjivarams with trendy blouses. 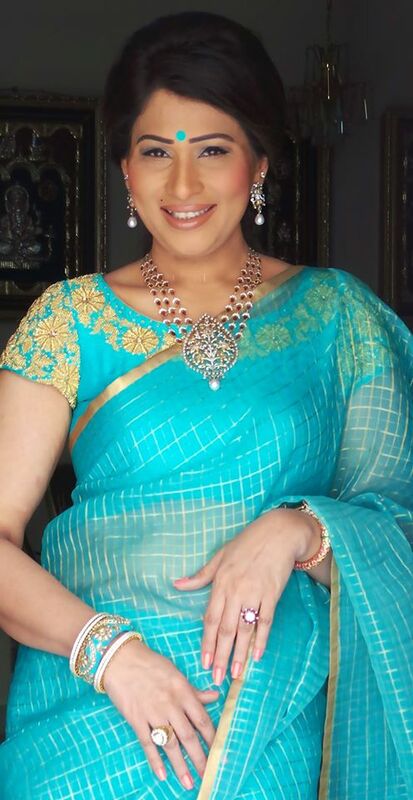 I loved the chocolate colour benaras saree, especially the blouse. 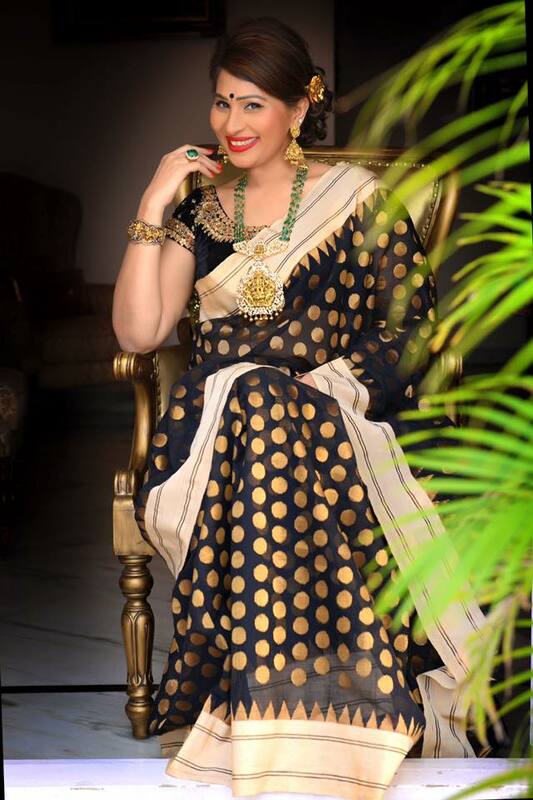 Shilpa Reddy in Classic Royal Blue Benaras Saree with heavy zari design all over the sari paired with long length full sleeves silk blouse. 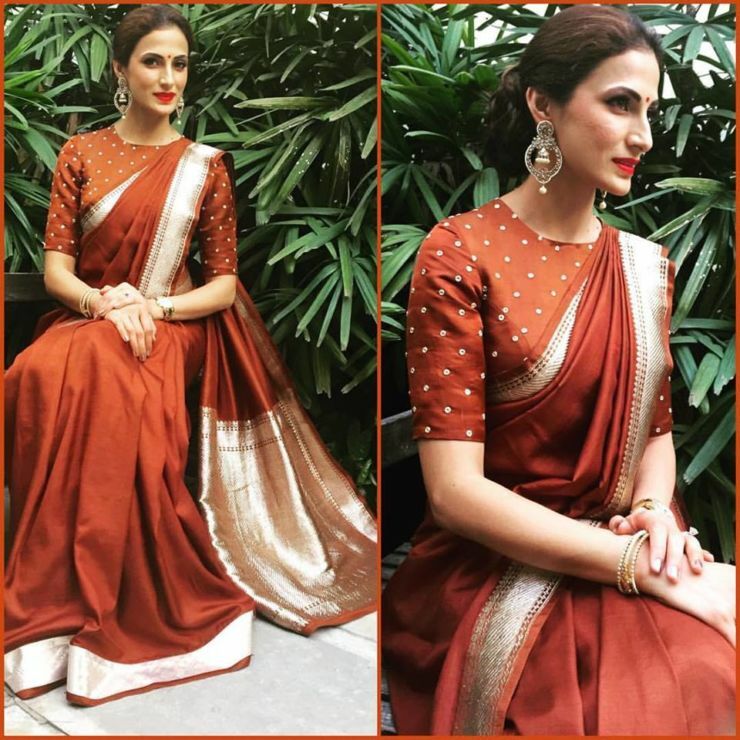 Shilpa Reddy in Chocolate Colour Classic Benaras Saree with self colour silk high neck elbow sleeves blouse with small zari buttas all over the blouse. 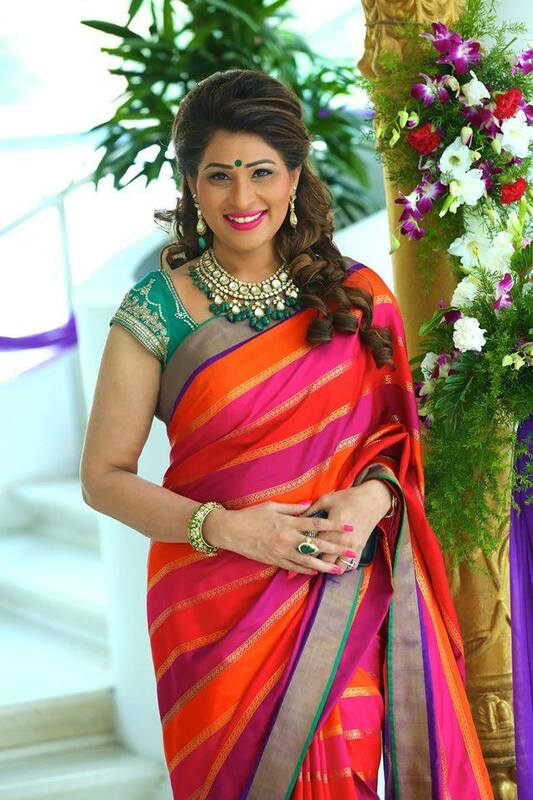 Shilpa Reddy wearing classic green kanjivaram saree with contrast pink zari border paired with sleeveless green silk blouse. 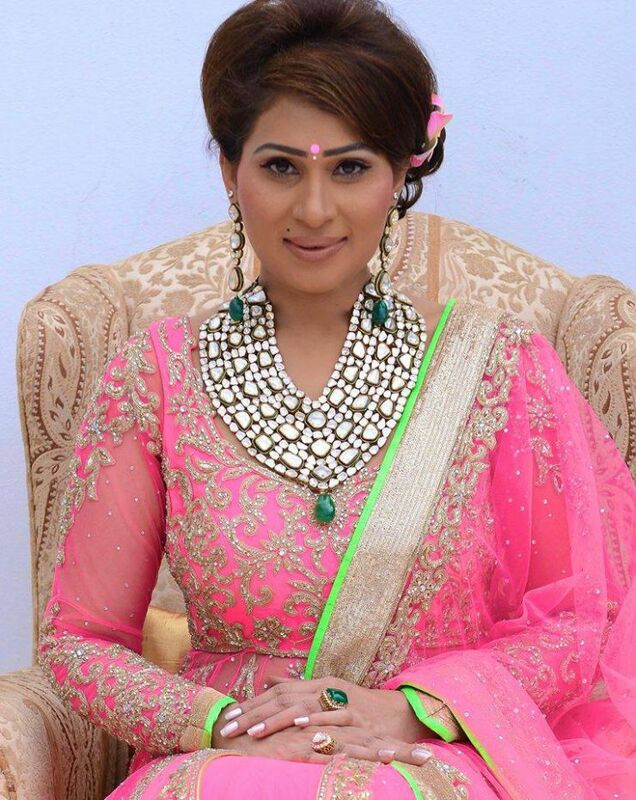 Heavy Diamond and Emerald jewellery set has improvised the look. 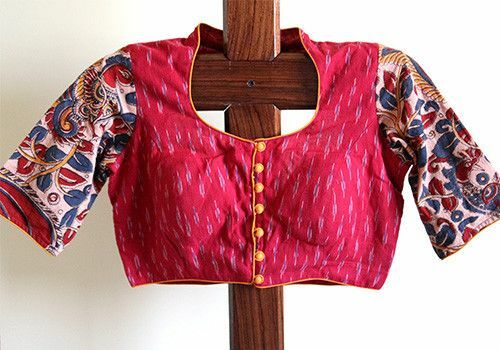 Kalamkari – This is a favourite word for traditional indian fashion freaks now-a-days. 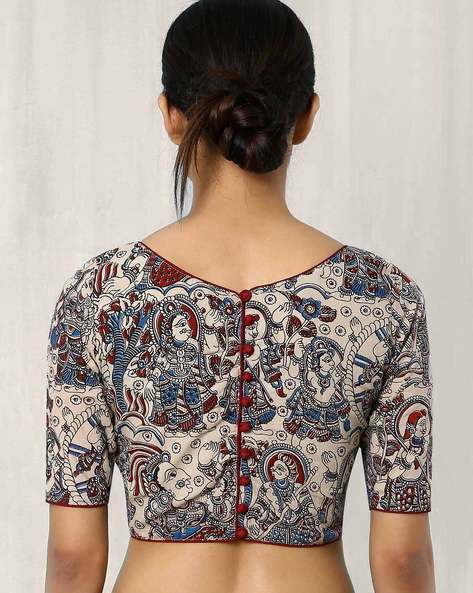 This Kalamkari Fabric is seen from galli boutiques to famous designers collection. 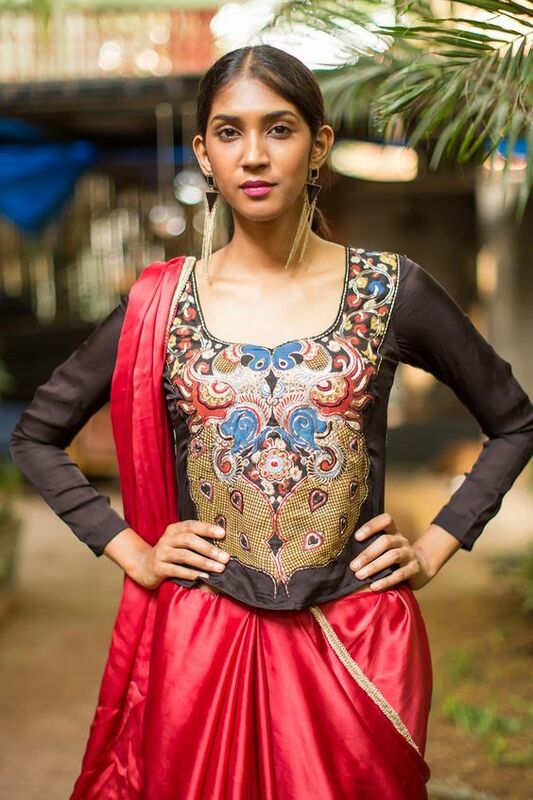 Famous designers like Neeta Lulla, Gaurang Shah are using Kalamkari Designs in their collections. 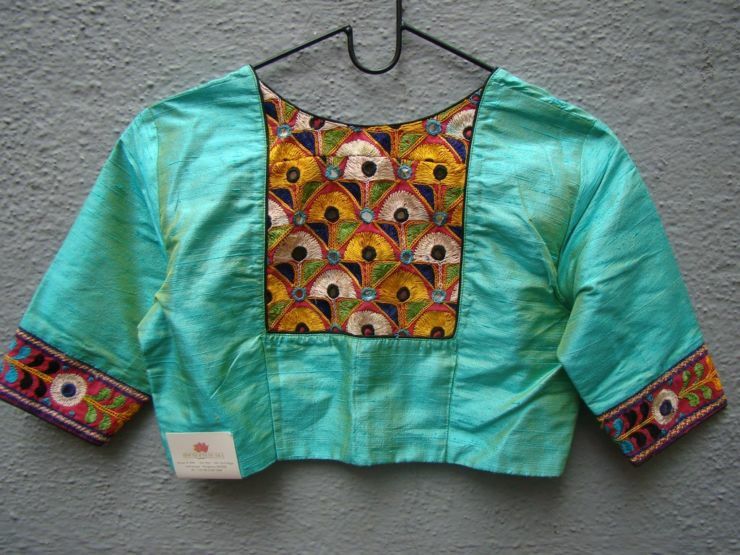 First, before digging further into topic, let us know something about this Kalamkari Indian Fabric. 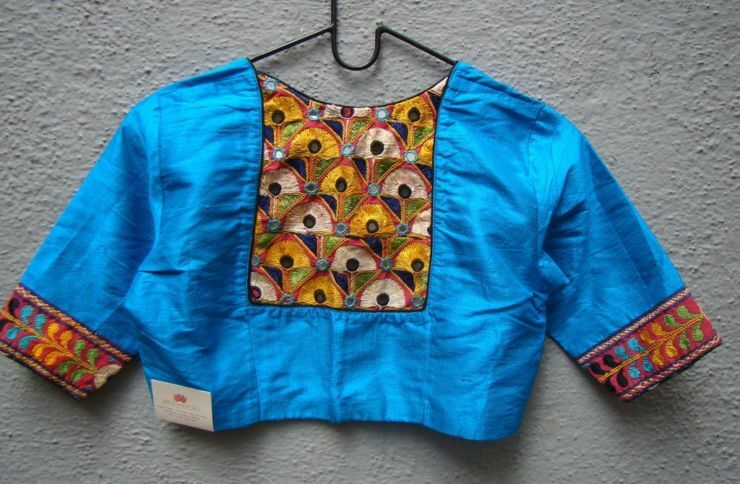 Kalamkari or qalamkari is a type of hand-painted or block-printed cotton textile, produced in parts of India. The word is derived from the Persian words ghalam (pen) and kari (craftmanship), meaning drawing with a pen (ghalamkar). 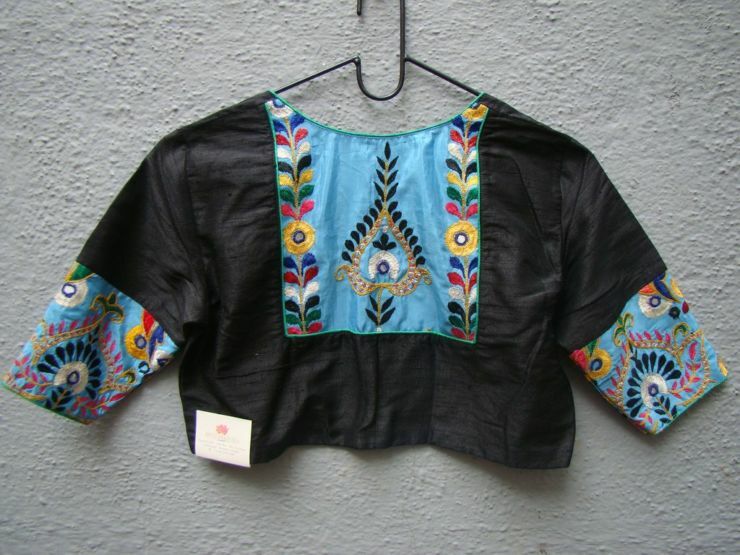 Ghalamkari later after usage became Kalamkari. 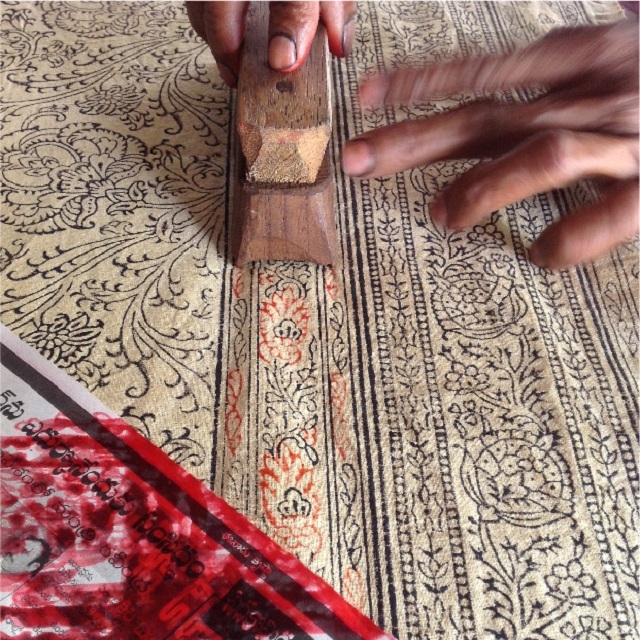 There are two distinctive styles of kalamkari art in India – the Srikalahasti style and the Machilipatnam style. 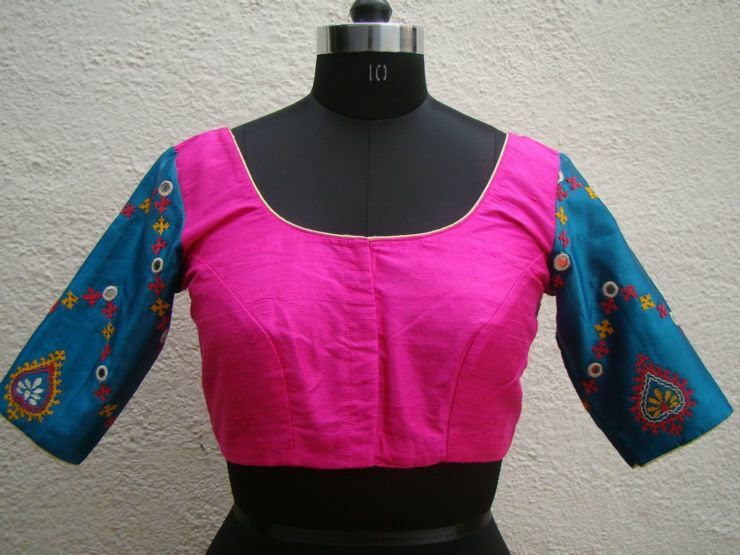 Srikalahasti style is mostly pen kalamkari whereas Machilipatnam style is mainly block printed. 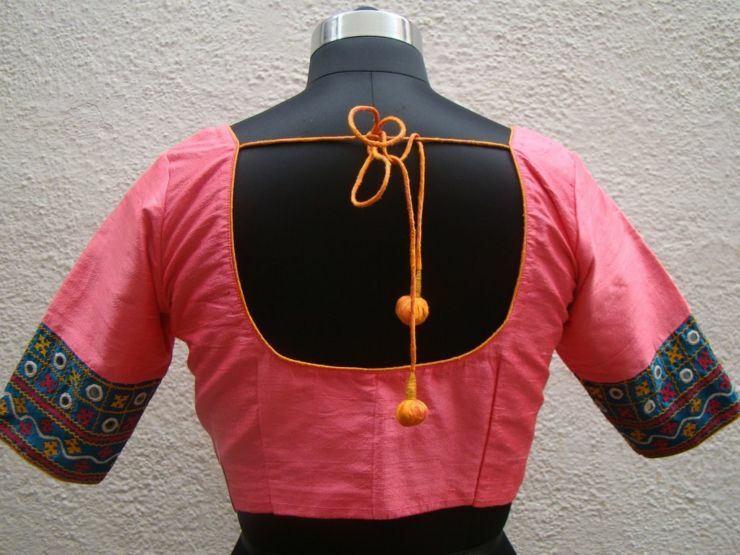 Only Natural syes are used for this fabric and it involves seventeen steps. 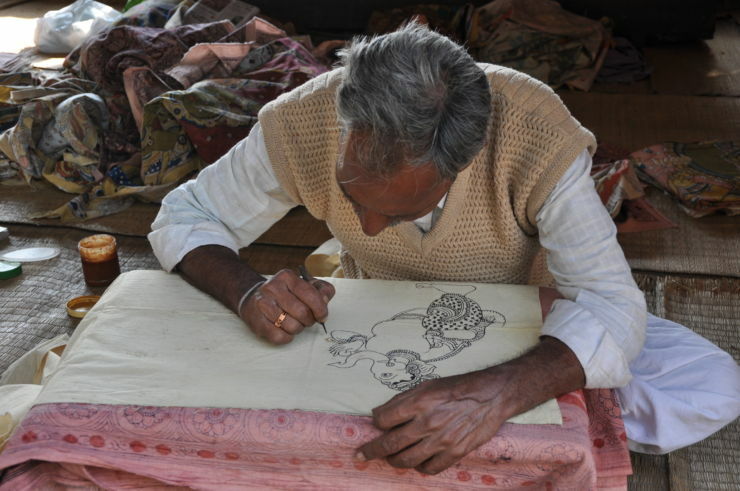 Kalamkari mostly flowered around temples and their patronage and so had an almost religious identity – scrolls, temple hangings, chariot banners and the like, depicted deities and scenes taken from the Hindu epics – Ramayana,Mahabarata, Puranas and the mythological classics. 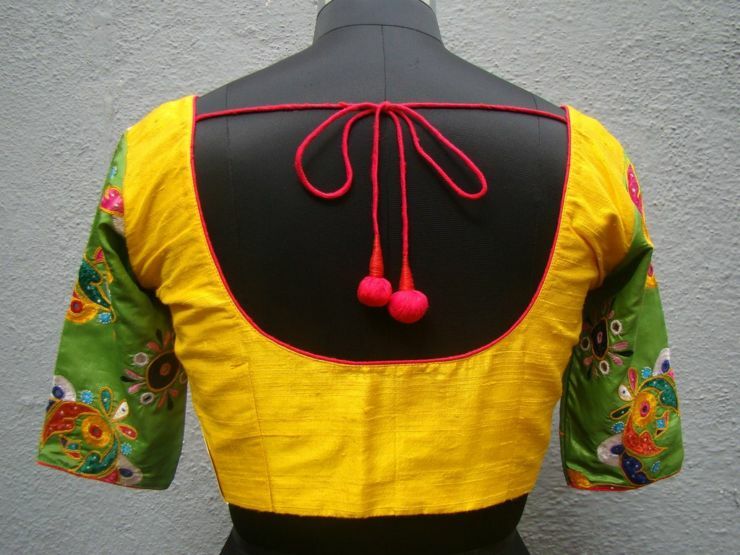 Kalamkari Designs are mostly used as Kalamkari Sarees, Kalamkari Blouse Designs, Kalamkari Dress material, Kalamkari Paintings for Home Decor. 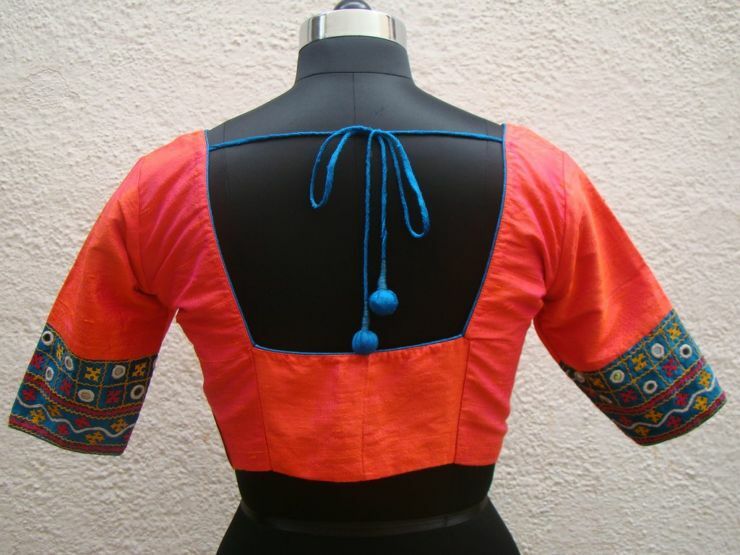 Showcasing few best Kalamkari Blouse Designs taken from various sources. 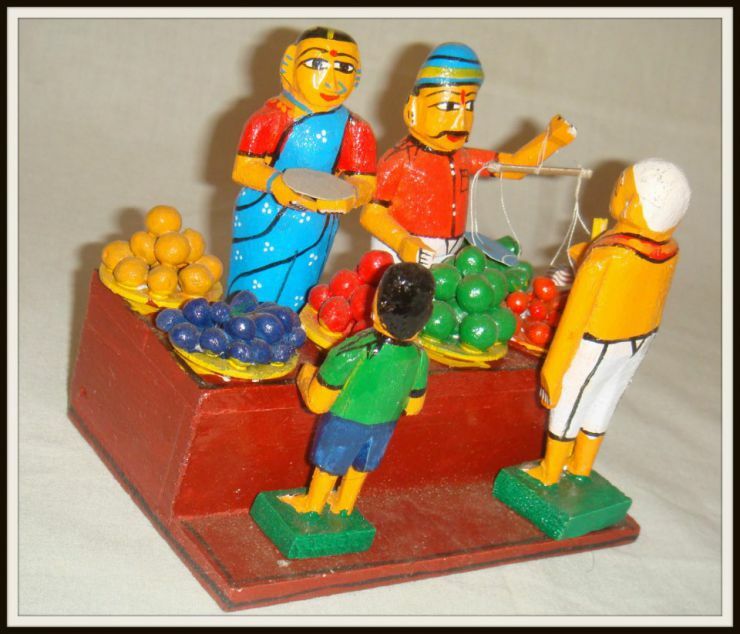 Kondapalli Bommalu – Bommalu means toys in telugu. 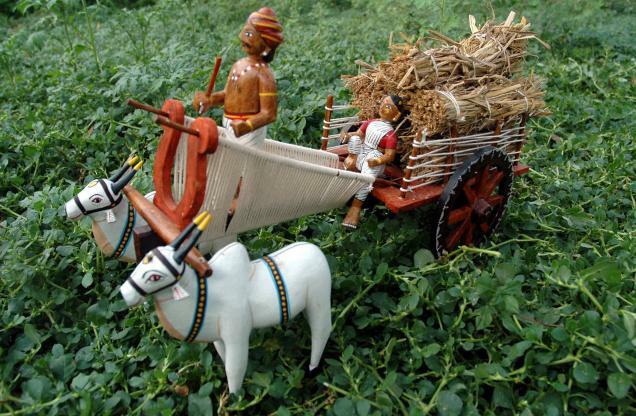 Kondapalli is a village near Vijayawada, Andhra Pradesh,India. 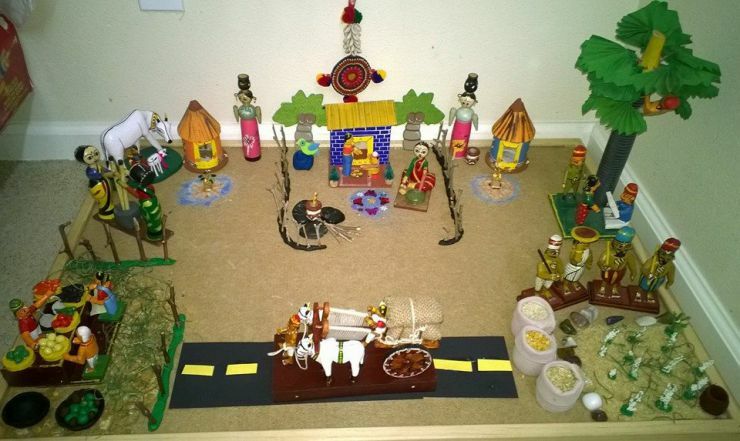 Hence these toys are named after the village, Kondapalli Bommalu. 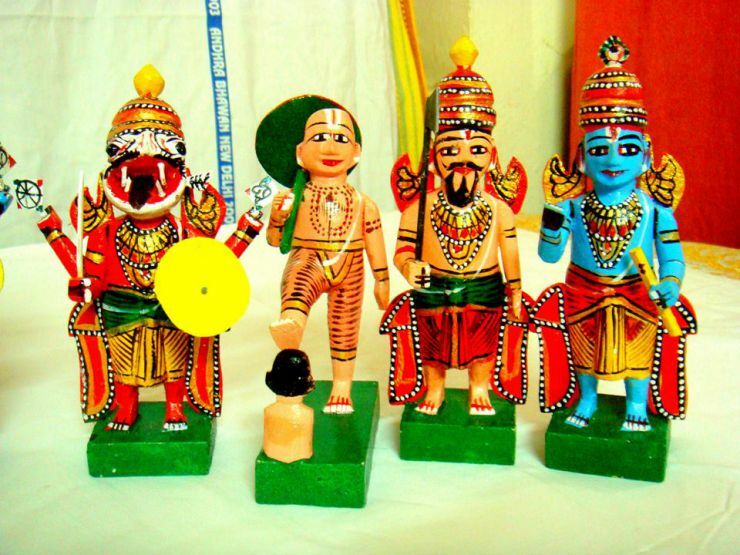 These toys are used for Bommalakoluvu during Sankranti and Navrathri. 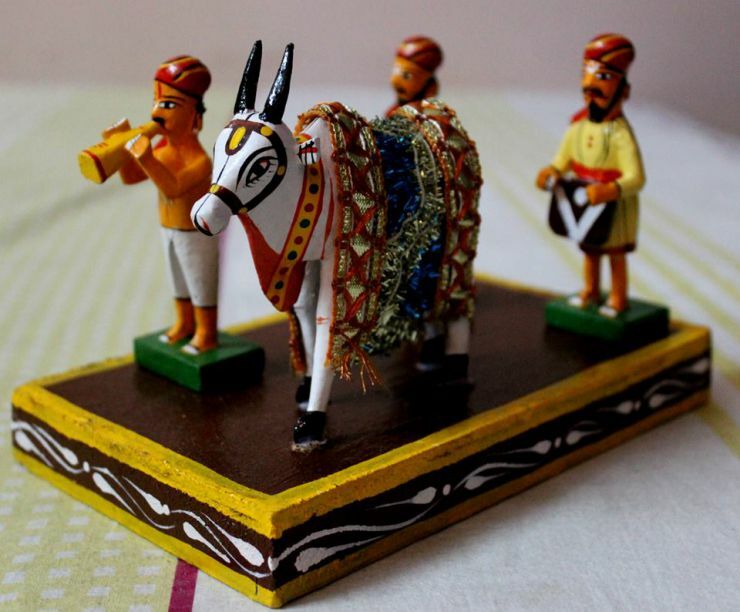 Artisans known as ‘Aryakshatriyas’ who make these toys are said to have migrated from Rajasthan several generations ago. 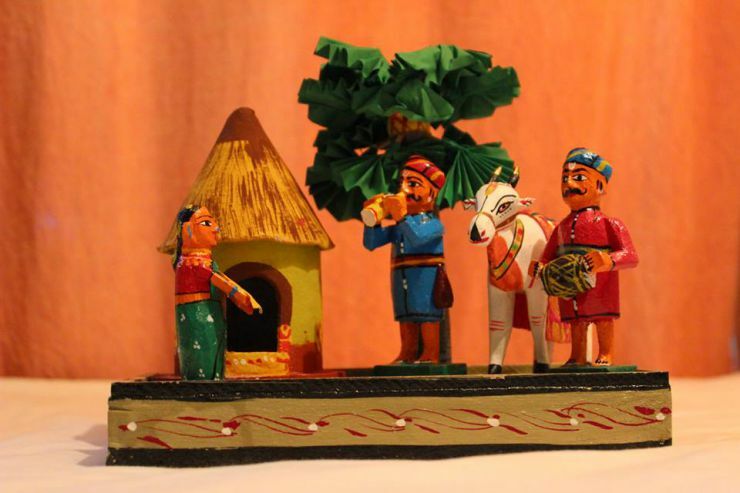 It is believed that these artisans migrated from Rajasthan to Kondapalli around 16th century bringing with them the art of crafting toys. 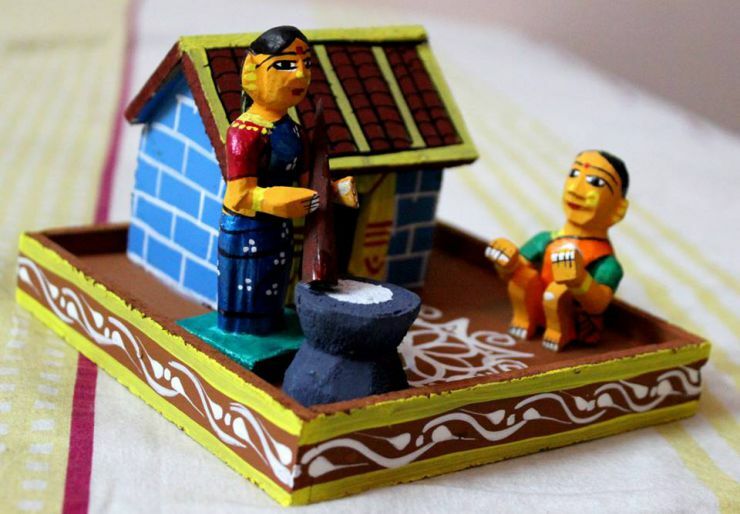 This 400-year old tradition has passed on from one generation to another generation with everyone taking part in the toy-making activity in ‘Toy Colony’ of Kondapalli. 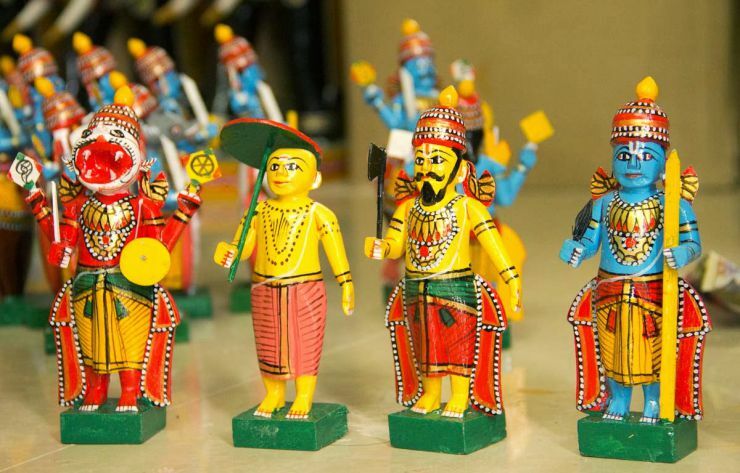 Kondapalli toys are made with locally available special light softwood locally known as Tella Poniki and painted with vegetable dyes, and vibrant enamel colours are popular for their beautiful artistic work. 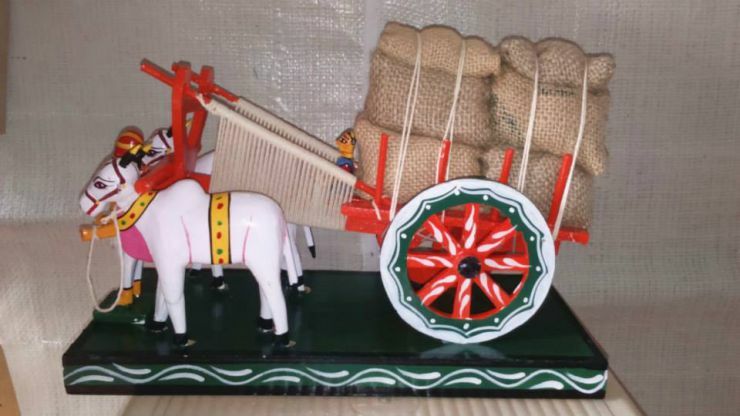 The most popular toys are Dasavatarams, Elephant Ambari, Bullock Cart, Geethopadesam, Palanquin-bearers carrying the bride and bridegroom, Toddy tapper, set of village craftsmen, scenes which depict forgotten village culture..
Hyderabad Sociallite Shreedevi Chowdhary in MBS Jewellers Collection. 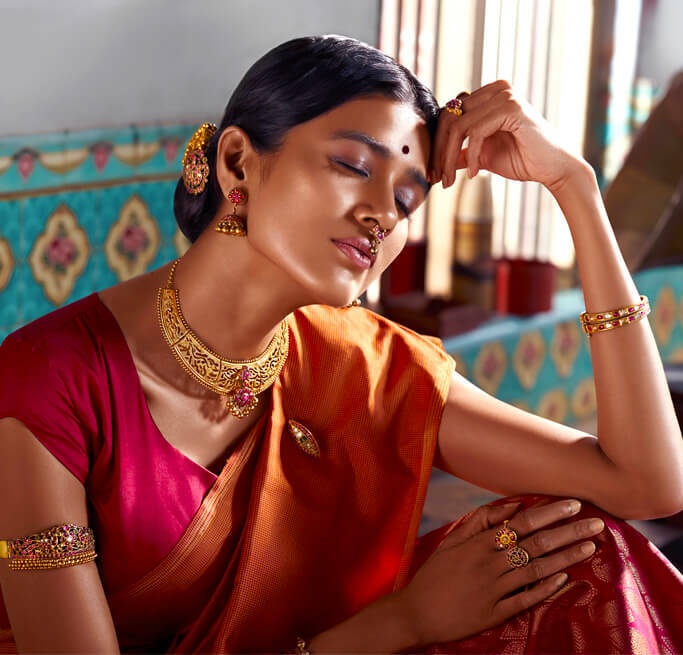 MBS bridal jewellery in Kundan and Diamond celebrates the moment of togetherness and mastercrafted by in-house designers in 22 carat Gold and inspired by the seven vows. Anciently cultivated tree from Mediterranean is Olive Tree. Black olives are allowed to ripen on the tree before they are harvested. The Olives are inedible raw and have to be cured before they can be eaten. That’s the reason olives are packed in oil or salted water or vinegar before they are consumed. There are many other ways of curing olives; however; canned black olives are mostly cured in a saltwater brine. Monounsaturated fats, the kind found in olives, when replacing saturated fats, may encourage weight loss. Olive oil consumption has been shown to breakdown fats inside fat cells, get rid of belly fat and reduce insulin insensitivity. The antioxidant nutrients in black olives impede the oxidation of cholesterol, thereby helping to prevent heart disease. Olives do contain fat, but it’s the healthy monounsaturated kind, which has been found to shrink the risk of atherosclerosis and increase good cholesterol. 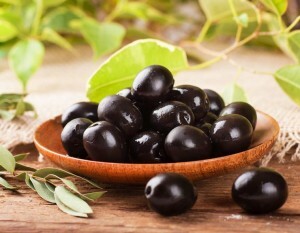 Black olives are a great source of vitamin E, which has the brilliant ability to neutralize free radicals in body fat. Especially when working with the stable monounsaturated fats found in olives, vitamin E can make cellular processes safer. If the DNA of a cell is damaged, it may well mutate and become cancerous. Studies have shown that a diet supplemented with olive oil leads to a lower risk of colon cancer, almost as low a risk as a diet rich in fish oil. 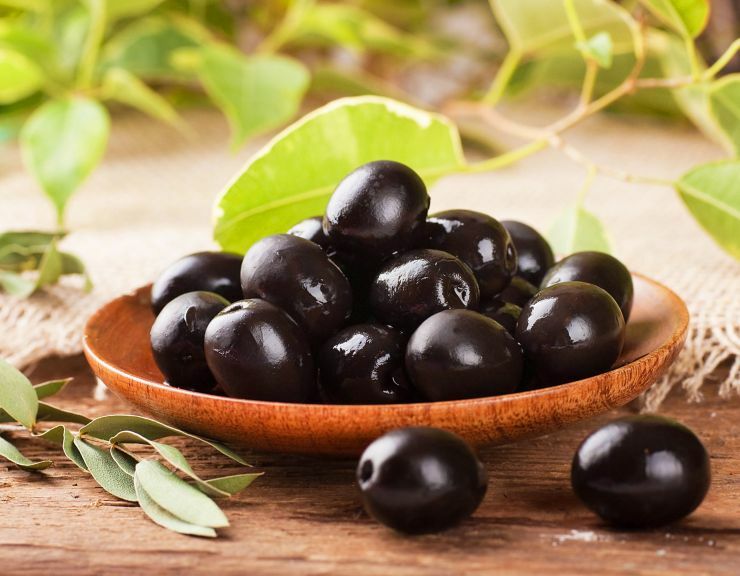 Black olives are rich in fatty acids and antioxidants that nourish, hydrate and protect. Vitamin E in Olives protect skin from ultraviolet radiation, thus guarding against skin cancer and premature aging. You can gain a healthy, glowing complexion by applying a few drops of olive oil . Moisturize hair with olive oil before any bath, and even condition by mixing it with an egg yolk and leaving it before rinsing and washing. The anti-inflammatory abilities of the monounsaturated fats, vitamin E and polyphenols in black olives may also help dull the asperity of asthma, osteoarthritis, and rheumatoid arthritis. Olive oil also contains a chemical called oleocanthal, which acts as a painkiller. Research has found that oleocanthal inhibits inflammation by the same means that drugs like Ibuprofen do. Frequent consumption of both vitamin E and the monounsaturated fats in black olives is associated with lower rates of colon cancer. These nutrients help prevent colon cancer by neutralizing free radicals. Olive oil’s protective function also has a beneficial effect on ulcers and gastritis. A cup of black olives also contains 17% of the daily allowance of fiber, which promotes digestive tract health by helping to move food through the system at a healthier pace. This keeps any one part of the digestive tract from having to work too hard and supports the ideal balance of chemicals and populations of microorganisms required for a healthy digestive system. Black olives are very high in iron. The ability of red blood cells to carry oxygen throughout the body is due to the presence of iron in the blood. If we suffer from a lack of iron, our tissues don’t get enough oxygen, and we may feel cold or weak. Iron also plays a vital role in the production of energy. It is a necessary part of a number of enzymes, including iron catalase, iron peroxidase, and the cytochrome enzymes. It also helps produce carnitine, a nonessential amino acid important for the utilization of fat. To top it all off, the proper function of the immune system is dependent on sufficient iron. New research may help explain how olives work to provide us with anti-inflammatory benefits, especially during circumstances involving allergy. It’s also possible that olives may have a special role to play as part of an overall anti-allergenic diet. Your circulation will improve and you’ll be able to breath easier with olive consumption. They can increase blood flow and help lessen the effects of illnesses such as asthma through its anti-inflammatory properties.